This is more than just a You're Wearing That? article. This article will highlight some of the previously-seen Halloween-themed jerseys I've shown as well as some of the monster hits and scary fights seen in recent years. Halloween is a fun time of year, but hockey routinely finds itself on the outside looking in when it rolls around. There could be a number of reasons why the NHL doesn't embrace it, but they appear to be the only league that doesn't allow their players to "dress up" for Halloween. However, in searching through the old Halloween jersey photos, the San Jose Sharks have participated in dressing up on Halloween. 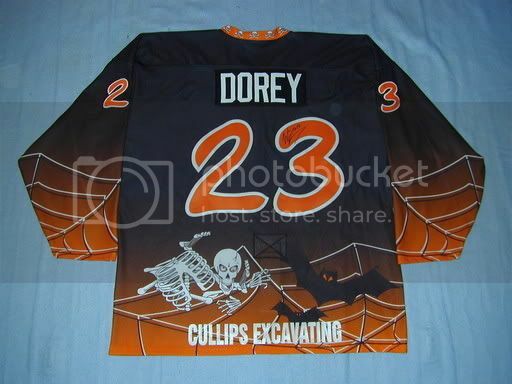 Let's take a look at some of the Halloween jerseys that have been featured on this site before. After you get past the jerseys, you can check out some hockey-related costume ideas, and then move on to the frightening fights and hits that have occurred in the NHL. On to the jerseys! 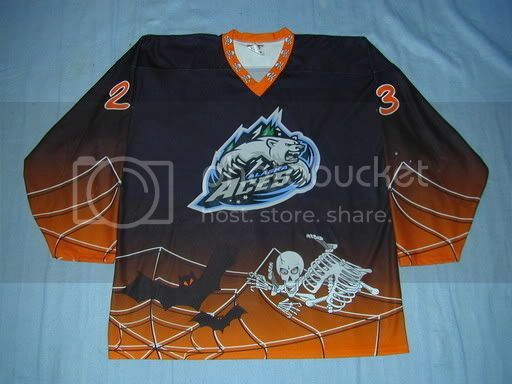 The ECHL's Alaska Aces "decided to celebrate Halloween in 2003 with this jersey. This one almost won my affection until I saw the back of the jersey". 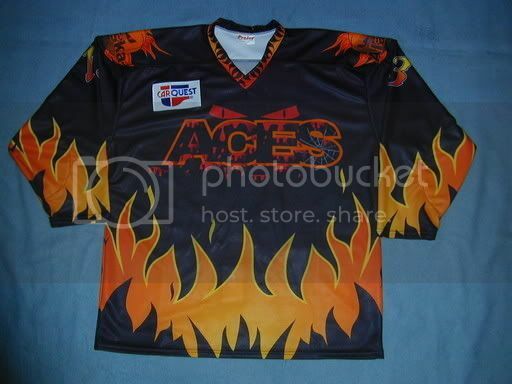 The Aces used to be called the Anchorage Aces when they played in the WCHL. "The Aces celebrated Halloween in 2001, which aren't great, but not bad". 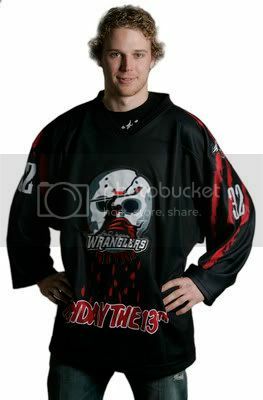 The ECHL's Las Vegas Wranglers wore a Friday the 13th jersey. That's almost as bad as the Lightning goalies painting their masks with Saw imagery. The CHL's Odessa Jackalopes wore Halloween jerseys that made them look like pylons, but I really like that logo for a Halloween theme. The DEL's Augsburger Panthers celebrated Halloween with this jersey, and this jersey in 2003. Advertising, anyone? Celebrate the occasion, and unclutter the jerseys a little. The CHL's Laredo Bucks celebrated Halloween with this jersey in 2006. It's solid, and certainly looks intimidating. The Bucks also wore this jersey for Halloween. I like the graveyard look. 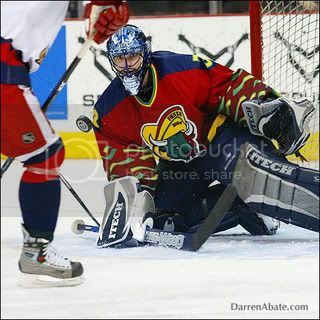 The AHL's Grand Rapid Griffins also used that graveyard template in 2004, but went with orange over the darker red colour. Still a solid look. The UHL's Quad City Mallards wore this Halloween jersey in 2005-06. The logo is scary simply due to its very rudimentary design, but it would have been better had the Mallards matched the logo to the promotion. The WHL's Seattle Thunderbirds wore this Halloween jersey in 2002, and this Halloween jersey in 2005. The 2002 version is very un-Halloween, but the 2005 version is much better. The AHL's Hershey Bears took to the ice for Halloween 2004 in these jerseys. 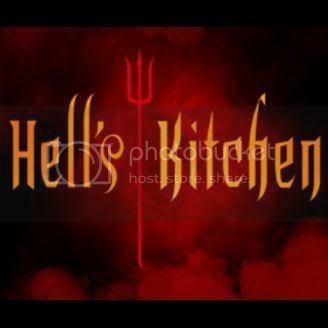 The shoulder patch looks like something from Hell's Kitchen. 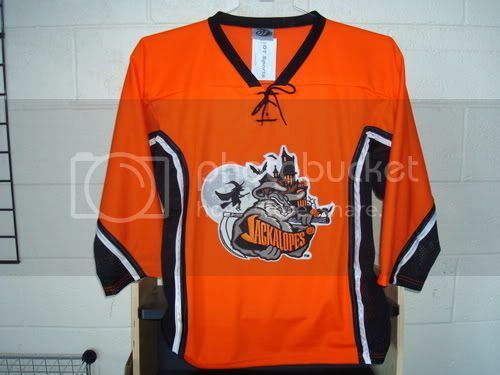 The ECHL's Jacksonville Lizard Kings wore a Halloween jersey in 1997. I'm not sure why they have the McDonald's Golden Arches on the hem, but the logo is decent. The CHL's Lubbock Cotton Kings also decided to use the graveyard background for their Halloween jerseys. The rear font is a great touch to these jerseys. 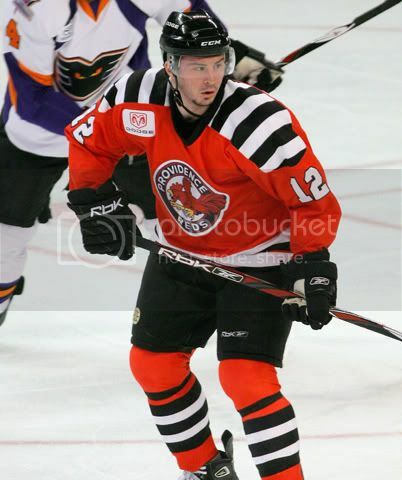 The ECHL's Richmond Renegades went with a Halloween jersey in 1999-00. The back of the jersey adds to the promotion as much as the front does. 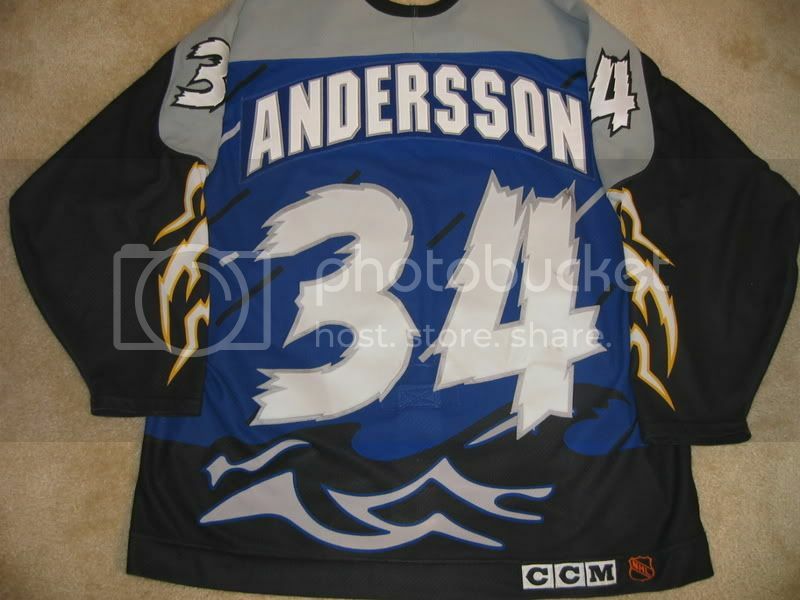 The CHL's San Antonio Iguanas wore a Halloween-themed jersey in 1999. Despite the great skeleton idea, the rear of the jersey needed some help. 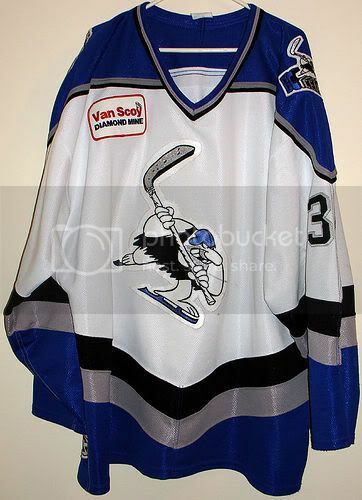 The CHL's Topeka Scarecrows actually wore this jersey as their alternate jersey in 2000-01. I don't know if they wore it on Halloween, but the back of the jersey could use some improvement. The NHL's San Jose Sharks wore Halloween-themed practice jerseys for charity last season. All the jerseys were auctioned off after the practice, and the money went to local San Jose-based charities. 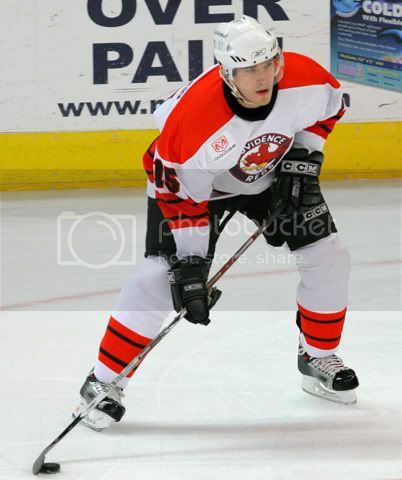 The AHL's Portland Pirates went with Halloween jerseys in 1998-99. The logo is neat due to the pirate becoming a skeleton. Matching the logo to the promotion is always a plus. The ECHL's Utah Grizzlies wore Halloween jerseys in 2004-05. I like the spider web, and the logo, which is usually a grizzly bear, is very appropriate. So there are the past Halloween-themed jerseys. Lots of different looks for Halloween, depending on which team you're looking at, but all are unique and fairly well-designed. The following are a few new Halloween hockey-themed costumes you may want to look into for next season. 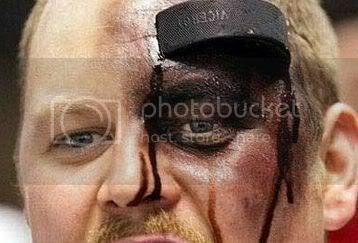 If you're into facial wounds, you should look at investing into the "puck stuck in the forehead" look. It gives that hockey fan who loves the game a great look and possible conversation piece. If you like to paint your face, maybe you can take that one step further. I present to you the "Jeff Carter full bodypaint kit". She's risking a lot if she plans on taking the ice like that. And no, I am not linking any frontal pictures, despite her wearing pasties. This is a PG-rated site, you know! Continuing on with my PG-rated look at hockey-fied Halloween costumes, this might not be the best idea for skating, but you'll get a ton of men talking to you at a Halloween party. I'm going to go with "Buyer Beware" on this costume. In what may amount to some hilarious and well-designed costumes, check out these guys in their Vancouver Canucks fan costumes. Pretty good considering the size of their heads. Well done to these two fans! Of course, you could head to your local thrift store to find some horrifying blazers and thick-collared shirts. 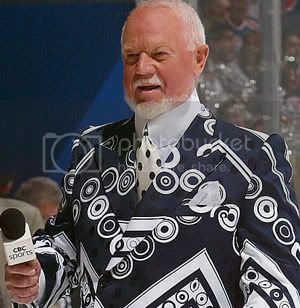 Get a little white hair dye and a clashing tie, and you have yourself the perfect Don Cherry costume. 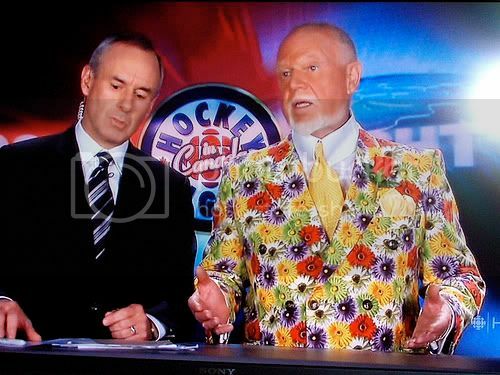 If you can, get a buddy to go as Ron MacLean, and you can do an entire Coach's Corner on Halloween! See? Hockey Blog In Canada can help you get ready for Halloween for next year already. Any of those costumes will set you back for less than $100. Guaranteed. However, the one thing I have avoided is blood and gore. These next videos should give you all the blood you need to see for a while, along with some bone-rattling hits. Click when you think you're ready! Zdeno Chara spills a lot of David Koci's blood. Nick Kypreos' career ended with Ryan Vandenbussche's left hand. Sami Kapanen gets destroyed by Darcy Tucker. RJ Umberger never saw Brian Campbell coming. 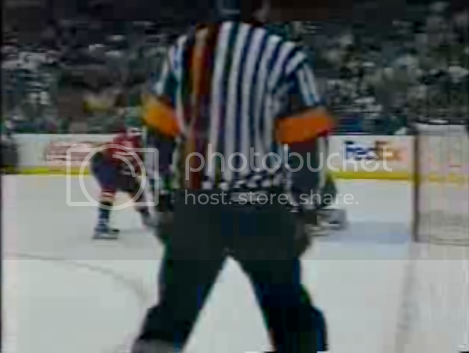 Apparently, Keith Jones was screaming "Get your head up" at Lindros. Those are some scary incidents. Halloween is the scariest time of year, but some of those hits are absolutely frightening. There's a quick Halloween-themed update for everyone. Happy trick-or-treating to the kids out there, and good luck on your candy hunt! If you're an adult going to a party, have fun, but please remember not to drink and drive. We want to be sure you can test out some of those costumes above next year. Until next time, keep your scary sticks on the ice! In doing some preparation for the next Teebz's Book Club entry on this blog, it dawned on me that the author of the book I am reading was once a "rink rat", and that the rink rat is dying breed of animal. Rink rats are those kids who show up at an indoor rink and play as much as they can with whomever needs them to fill a spot on the ice. Goaltenders come at a premium, so being a rink rat with pads was the ultimate way to get on the ice for some additional playing time. But with the number of indoor rinks and the cost to rent indoor ice increasing, there simply are less rink rats to fill the void. Is the rink rat on the verge of extinction, or has the rink rat's environment simply forced him or her to find a new place to lace up his or her skates? First off, let me say that the rink rat holds a very important position down in the world of hockey. He or she is the person that can change a five-person shoot-around on a goalie into a three-on-three game. More importantly, a rink rat with pads can be the difference between a "clear it to center ice" game and a full-length, end-to-end game. The majority of the time, the rink rat plays without paying for ice time as a token of gratitude towards the rink rat for helping out the shorthanded players on the ice. But how many players do you see showing up an hour or two before their own practices with the hope that another team is short, thus allowing them the opportunity to be on the ice for additional practice time? Does this even happen anymore? Are teams that are shorthanded willing to let someone younger on the ice to fill the void? There were times not so long ago where players would spend more time on the ice than in school. Mario Lemieux, for example, left school at the age of 16, having only completed up to Grade-10, to pursue his hockey career. While I fully expect and encourage all children to stay in school, Lemieux was clearly a rink rat who excelled at the game of hockey. Sidney Crosby could probably be considered today's North American standard for a rink rat. Crosby spent a ton of time as a youngster in his basement, firing pucks at an old dryer. His family lost a battle with the Nova Scotia Minor Hockey Council when he applied at the age of 13 to play alongside 17 year-old players. Crosby was a straight-A student and worked hard in school. However, that drive and work ethic transferred over to the ice as well, making him one of the best players ever in Nova Scotia and in junior hockey. So here's my question to you, readers: is the rink rat a dying breed of animal in the hockey world? Would you say that they exist at all, or perhaps in a different place? Does today's youth have the drive for excellence as shown by Mr. Crosby, or is he an exceptional case of talent plus work ethic? Will we ever see a true rink rat again? And here's something to ponder: despite Canada's track record at the World Junior Championships, are we a nation that produces more rink rats than Russia or the USA? And does being a rink rat harm players more than it helps them, such as the case with Stefan Legein? Are we encouraging hockey burn-out by having players turn into rink rats? Let me know in the comment section. I'd be particularly interested in hearing from younger readers about their rink rat abilities, and from parents of rink rats. I'm simply curious as to how rink rats are perceived, and how Canadian rinks rats may differ from any other nation's rink rats. Hit me up with a comment, and let me know what you think of rink rats. It's Wednesday, aka "Hump Day", and I have about a billion and one things that I have to get done today. Some of these things are at the top of the priority list, while others are merely things that I want to see accomplished. With that in mind, Hockey Blog In Canada is taking a day off. I have no advertising, so it's not like they can get angry with me. Besides, I'm nearly over that ridiculous cold that I have, and I'd like to be healthy before returning to work next week. Hart Designs is running a contest to have your goalie mask painted professionally. Click here to read the rules, and click here to sign up. Comments will remain open today. If there is anything you want to see on this blog, or a topic you want to see covered, let me know in the comments. Otherwise, fire me an email. Edmonton Oilers are holding their Caps for Cancer online auction through to November 6. If you'd like some autographed Oilers schwag, get in on the bidding here. The Pittsburgh Penguins are the next team to unveil their new alternate jerseys, and that happens on November 6. Baby blue rocks the Mellon Arena once again! Yesterday was a big day for the New York Islanders. The last time they introduced a new alternate, we got to see what skating pylons would look like, and enabled this writer to use the term "New York Pylon-der". 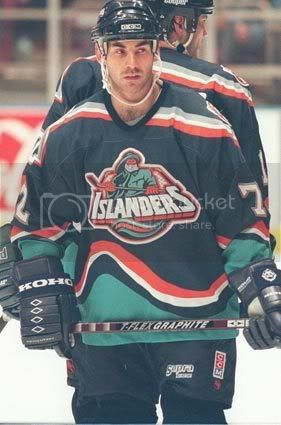 Of course, there was the mass hysteria during the 1995-98 era when the Islanders went to the Fisherman jersey, evetually forcing the team to return to the Islanders' traditional logo and uniform after fans threatened to burn the Nassau Veterans Memorial Coliseum down. With the press conference yesterday, the Islanders unveiled their new alternate uniform, and everyone held their collective breath. However, the entire fear of this new alternate jersey was laid to rest upon the unveiling of the retro Islanders alternate jersey. The Islanders began wearing this version of their historical look in 1976-77, giving this new alternate jersey a very accurate look. The Islanders did wear a retro 1972 jersey for one game during the 2006-07 season, seen here on Aaron Asham. The numbers on the sleeves and back of that retro jersey are orange, rather than the white numbers seen on the new alternate. While I am a huge fan of recycling, it's nice to see the Islanders coming up with a new idea rather than just recycling an older jersey. Enough of the past, though. Let's break down these new jerseys. First off, the Islanders are going to a lighter blue for the base colour of the jerseys compared to their current home jerseys. This is consistent with the 1976 look. The blocks of colour on the sleeves are entirely accurate for the 1976-77 version of their jersey, but, in 1977-78, the Islanders went to smaller stripes, meaning these new alternate jerseys represent only one season of Islanders history. The rear of the jerseys are easily readable, and make for identifying players an easy job. The wide stripes make the numbers look especially large, but the optical illusion only makes it easier to identify your favorite Islander. 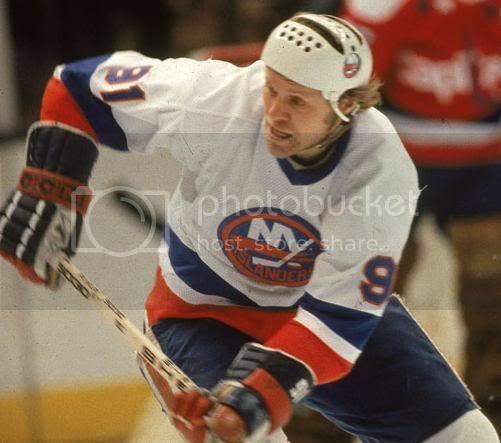 However, in 1976, there were no names on the backs of the Islanders' jerseys. 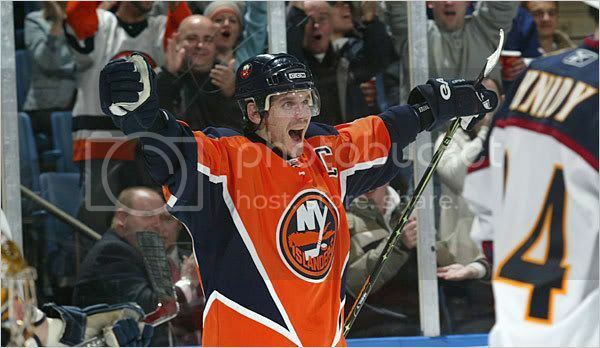 That didn't begin until the following season when the Islanders removed the white stripe off the sleeve of the jersey. The accuracy of these new jerseys is beginning to falter. Looking at this view of Bill Guerin, what's the first thing that strikes you as being odd? Those socks annoy the heck out of me! Why can't the stripes go all the way around the leg? How difficult is it to have a full stripe on the sock? Reebok, do you have any idea what a stripe is? Are you afraid that you might be representing your major competitor if you complete the stripes? The front of the jersey is very clean, and looks very respectable. There are no front shoulder numbers, but the lace-up neckline is a little unnecessary. In 1976, they didn't tie the neckline up, so why add it here? It doesn't detract from the jersey, but it just seems unnecessary. All in all, I'm quite happy with these jerseys, despite me being critical of the accuracy of the look. The Islanders really didn't screw anything up, but I would have liked to have seen the jersey worn during the Islanders' dynasty era instead. Also, the four stripes they have worn on the shoulders of their jerseys haven't been included on these retro alternates, so it will be interesting to see if they honour the timeframe of the jersey and keep them off. Good work, New York Islanders. The retro alternate jerseys look pretty decent. After all, it could have been much, much worse considering your history. I had written an article some time ago about the best Brian Burke quotes that he has ever uttered to a microphone. Some were funny, some were poignant about issues, but the key was that they resonated due to their truths. It's very clear from a few of the comments made by Mr. Burke that he has absolutely no friendship with Al Strachan, a reporter who works for Fox News and appears on Hockey Night In Canada's Satellite Hotstove segment on CBC. Why the CBC has Al Strachan on national television is beyond me because, personally, he's a hack. I don't know where he gets his info from, but some of his "stories" seem to be way out there. I'd like to recall a Brian Burke comment spoken when he was still the GM of the Vancouver Canucks. Al Strachan had reported on the Satellite Hotstove segment that Burke had discussed trading Brendan Morrison and Bryan Allen for Mike Peca, and was insistent on Burke having discussed it with Sabres' GM Darcy Regier. Burke appeared on Hockey Night In Canada a week later with this comment: "The very fact that Al Strachan reported it, in my opinion, makes it extremely likely it has no factual basis what-so-ever. I deny it specifically and categorically. I have never discussed Brendan Morrison with Buffalo, I have never discussed Bryan Allen with Buffalo and I have not talked to Darcy Regier in three weeks. So I'm shocked that a respectable media outlet like Hockey Night in Canada would allow this garbage rumour-mongering to take place. I'm amazed that whoever produces that show would tolerate this." And that Brian Burke comment brings me to Al Strachan's recent Satellite Hotstove commentary. Scott Burnside, a respectable reporter for ESPN, tuned into the Satellite Hotstove this past weekend, and was slightly surprised at Al Strachan's "reporting" of a story that Lightning co-owner Len Barrie had spent time in the Lightning's dressing room in Europe for the opening weekend, diagramming power-play and penalty-killing strategies. He also suggested that the Lightning are "imploding" and that "the league over/under" on Barry Melrose's coaching tenure is mid-November. If you'd like to see Al Strachan utter these very words, please click here. Just remember: Strachan was told by "one of the players". That's simply horrendous reporting. It would be far better if Strachan would just admit that he made it up. Yesterday, Oren Koules, co-owner of the Lightning, told ESPN.com that Strachan's report was "a blatant lie. It never happened". I'm going to side with Koules on this one. First off, Len Barrie designing powerplay strategies? Len Barrie played 184 NHL games in his career. He had career totals of 19 goals and 45 assists. Yet, Barrie is telling Lecavalier, St. Louis, Stamkos, and the rest of the Lightning how to play on the powerplay? Are you kidding me? I'm not sure why Strachan subscribes to theories that hold no water. For him to appear on Hockey Night In Canada with this "garbage rumour-mongering" only makes Brian Burke look like a genius. Al Strachan could be the PHWA's Eklund with crap like this. Secondly, I'm pretty sure that Barry Melrose, Cap Raeder, Rick Tocchet, and Wes Walz are a competent bunch when it comes to strategies. Melrose and Raeder took a Gretzky-led team to the Stanley Cup Finals. Tocchet has won Stanley Cups as a player, and was a solid powerplay guy during his time on the ice. Wes Walz was a penalty-killing expert, and knows how to play in a defensive system. But, according to Al Strachan, Len Barrie would rather undermine the coaches that they hired by pushing them aside to show the players how to play in the systems? Thirdly, why would Barrie go into the dressing room during the opening weekend to show the players powerplay and penalty-killing strategies when they were 0-1 on the season? What purpose would that serve? If one loss generates that kind of break-neck reaction from Len Barrie, he's in the wrong business. And it's not like the Lightning got blown out in that first game. They lost 2-1 to the Rangers. They went 0-for-4 on the powerplay, and gave up the game-winning goal while killing a penalty, resulting in them being 6-for-7 in the PK department. But it's hardly the kind of thing where you need to have a meltdown, and bring in some "specialist" to help when there is a man-advantage. Barrie coming into the dressing room to design strategies is complete nonsense after a 2-1 loss. Personally, Strachan's reporting disgusts me. He gets airtime on CBC and The Score highlight channel, but he's a complete hack when it comes to hockey. Case in point? Strachan reported on the Satellite Hotstove last season before the trade deadline that Tampa Bay's Vincent Lecavalier would ask for a trade in the off-season from the Lightning. Strachan indicated that his source is very reliable and close to Lecavalier. The result? Lecavalier, of course, signed an 11-year contract extension in the off-season, essentially making him a member of the Lightning for life. In January, Strachan reported on the Satellite Hotstove that then-Maple Leaf Mats Sundin would accept a trade to the Vancouver Canucks. The result? Sundin vetoed any trade from the Leafs by the trade deadline, and then rejected a contract offer of $10 million per season from the Canucks in the off-season. On that same episode, Strachan reported that the Philadelphia Flyers were the front-runners for Peter Forsberg's services. Forsberg ended up signing in Colorado. Strachan also reported that Olli Jokinen requested a trade from the Panthers. In two episodes, Strachan goes 1-for-4 in his "reporting", yet that Jokinen "fact" was pretty much known throughout the hockey world. How does this guy keep a job? That's absolutely horrific. Do some investigating, and get your facts correct, Al. Otherwise, keep your yap shut. You do a great disservice to your colleagues and peers by doing this sort of reporting. Frankly, Al Strachan should go away quietly, and stay far away from hockey altogether. Last night, the Chicago Blackhawks took some time away from their game against the Detroit Red Wings to preview their game on January 1, 2009. That date, as you may know, is the date of the NHL Winter Classic where the Blackhawks will square off against the Red Wings in the outdoor match being held at Wrigley Field in Chicago. It has been discussed that the Blackhawks may use their "barber pole" look like they did in 1992 for the NHL's 75th anniversary and in 1946 as their regular uniform, but the Blackhawks and Red Wings decided on two other eras to wear. The Detroit Red Wings, who will be the visitors in the Winter Classic, have opted to represent the 1926-27 Detroit Cougars. They did make one adjustment to the jersey in that they will wear the Winged Wheel as a shoulder patch. Personally, I like the look of the Olde English "D". It gives that retro feeling just from the look of it. 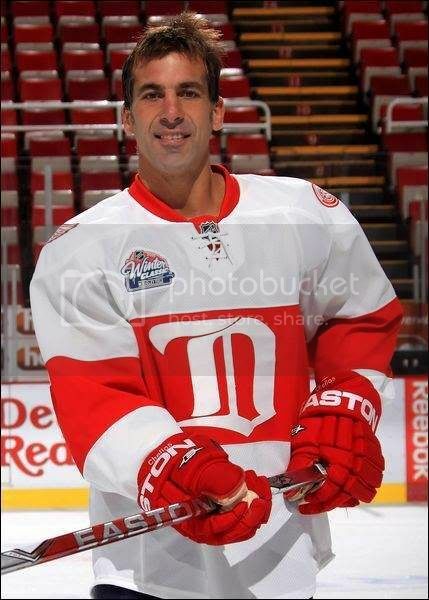 The Red Wings have only released the one picture thus far, so I can't comment on the fonts being used, but, if they are looking to stay true, NHLUniforms.com has what the Cougars wore in 1926-27. Let's hope that the Wings go all-out, and bring back the striped socks as well. The Chicago Blackhawks, on the other hand, have released many pictures. 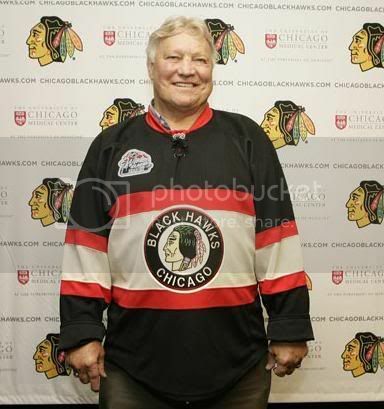 The Blackhawks have decided to honour the 1936-37 version of the Chicago Black Hawks, as seen here on former Blackhawk Bobby Hull. 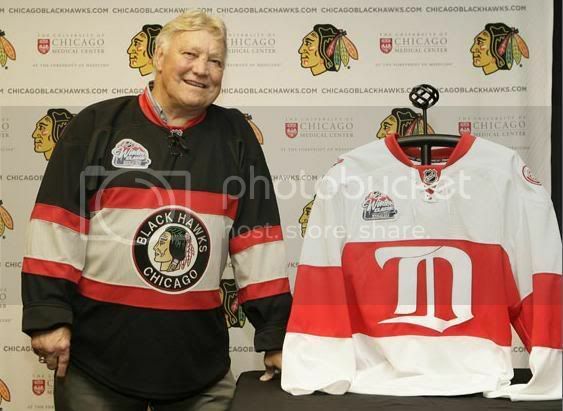 The Blackhawks' retro look is highlighted by the retro logo on the jerseys, which gets a huge thumbs-up from me. What does bother me, though, is that the rear font is a modern font rather than what the '36-37 Black Hawks wore. Why can't they wear the old-school numbers? Again, the hope from this writer is that they bring back the retro socks. Those old-time 'Hawks socks are sweet. Both teams will feature the Winter Classic patch on their jerseys. I like the look of these jerseys, even with patch, due to them being uncluttered. There won't be any floating letters for the captains or alternate captains on the jerseys, so there shouldn't be any distractions away from the look of the game. Here's my major beef. The RBK Edge jerseys worn on the ice will cost fans a ridiculous $350! The replicas, which must be lined in gold, will still set you back $175! Are you kidding me?!? Not only that, but if you want a name on the back of the jersey, you better be prepared to shell out an additional $80! That's $430 for a fully-customized professional jersey, and $255 for a replica jersey! I think I just threw up in my mouth a little. Look, I just want to cheer for my team. I don't want to buy shares in it unless I want to buy shares in it. This pricing idea from Reebok and the NHL is absolutely ludicrous. We're in some tough financial times here, yet Reebok and the NHL are still squeezing blood from a stone. 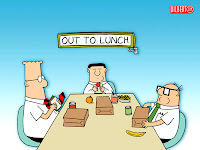 Wake up, corporate heads, and smell the economic downturn. Maybe the NHL offices in New York City can't see Wall Street from where they are? All in all, the jerseys turned out to be excellent, and really will give a nostalgic feeling to Wrigley Field. Chicago and Detroit have battled each other closely over the last year and a bit, so I expect the Winter Classic to be just as hotly contested. You can't go wrong with two solid teams doing battle in timeless throwback jerseys. Tonight is a special night in the NHL. All 30 teams take to the ice for the only time this season. It doesn't matter what station you turn on, there has to be at least one hockey highlight. Yes, that includes ESPN. What makes this weekend especially weird is that there are no NHL games scheduled for tomorrow. Nada. Zilch. Zero. In any case, you get a huge helping of hockey tonight followed by a day of rest. I can live with that, so here's where you'll be tuning into if you want to follow a certain team tonight. 4:00pm EST - New Jersey Devils at Philadelphia Flyers: MSG Plus, ComCast SportsNet in Philly. Third vs. fourth in the Atlantic. No Daniel Briere for Philly tonight due to a torn abdominal muscle. Jamie Langenbrunner is questionable for New Jersey with a lower body injury. 7:00pm EST - Atlanta Thrashers at Boston Bruins: SportsSouth, New England Sports Network. Fourth in the Southeast vs. third in the Northeast. Marty Reasoner is questionable for Atlanta tonight with a lower body injury. 7:00pm EST - Ottawa Senators at Toronto Maple Leafs: CBC for Ontario and west in Canada, NHL Network nationally in the US. Third vs. fifth in the Northeast. Jeff Finger may return tonight for the Maple Leafs if his foot injury has healed. Jiri Tlusty of the Maple Leafs has been sent down to the AHL's Toronto Marlies, and will not be in the lineup. 7:00pm EST - Anaheim Ducks at Montreal Canadiens: CBC in Quebec, RDS in Quebec, KDOC in California. Third in the Pacific vs. second in the Northeast. Andrei Kostitsyn, Georges Laraque, and Carey Price are all questionable for the Canadiens in tonight's game. Kostitsyn is still suffering from a concussion, Laraque is nursing a groin injury, and Price is battling the flu. 7:00pm EST - Carolina Hurricanes at New York Islanders: Fox Sports Network-South, MSG Plus. Second in the Southeast vs. fifth in the Atlantic. Tuomo Ruutu is questionable for the Hurricanes in tonight's game with a groinm injury. Brendan Witt of the Islanders is questionable with a lower body injury. 7:00pm EST - Pittsburgh Penguins at New York Rangers: Fox Sports Network-Pittsburgh, MSG. Second vs. first in the Atlantic. Matt Cooke and Hal Gill are both questionable with Pittsburgh for tonight's game as both have upper body injuries. 7:30pm EST - San Jose Sharks at Tampa Bay Lightning: SunSports in Florida. First in the Pacific vs. fifth in the Southeast. Douglas Murray of the Sharks is questionable with a hand injury. 8:00pm EST - Los Angeles Kings at Nashville Predators: no television broadcast. Third in the Pacific vs. fourth in the Central. Neither team has anyone close to returning from injury. 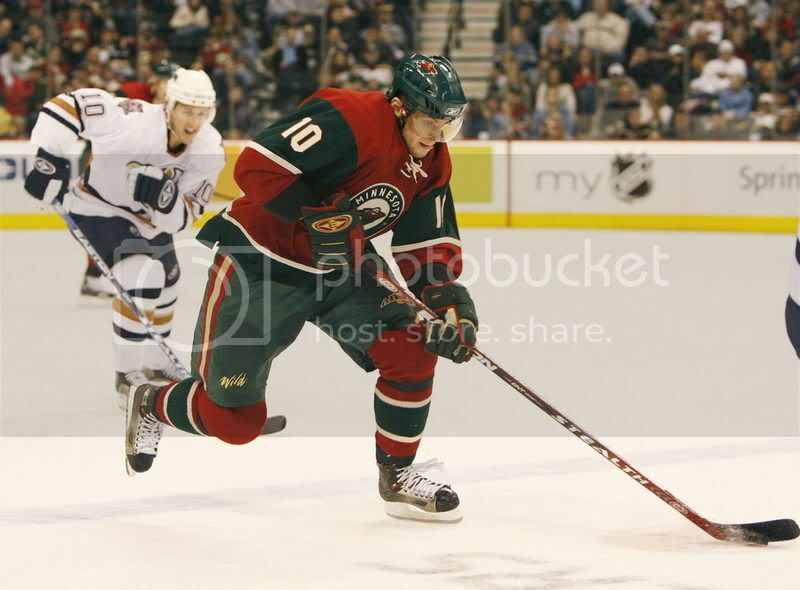 8:00pm EST - Columbus Blue Jackets at Minnesota Wild: Fox Sports Network-North. Fourth in the Central vs. first in the Northwest. Marian Gaborik and Owen Nolan of the Wild are both questionable with lower body injuries. 8:00pm EST - Washington Capitals at Dallas Stars: ComCast Sports Network in Washington, KDFI in Dallas/Fort Worth. Second in the Southeast vs. second in the Pacific. John Erskine and Tom Poti are questionable for the Capitals tonight. Erskine is out with a calf injury while Poti is nursing a groin injury. Doug Janik, Jere Lehtinen, and Steve Ott are all questionable for Dallas tonight. Janik has a face injury, while Lehtinen and Ott are nursing groin injuries. 8:30pm EST - Detroit Red Wings at Chicago Blackhawks: Fox Sports Network-Detroit, WGN in Chicago. First vs. second in the Central. Niklas Hjalmarsson and Brent Sopel are questionable for Chicago tonight. Hjalmarsson is out with a rib injury, while Sopel has an undisclosed injury. The Blackhawks have confirmed that Nikolai Khabibulin will start in net against the Wings. 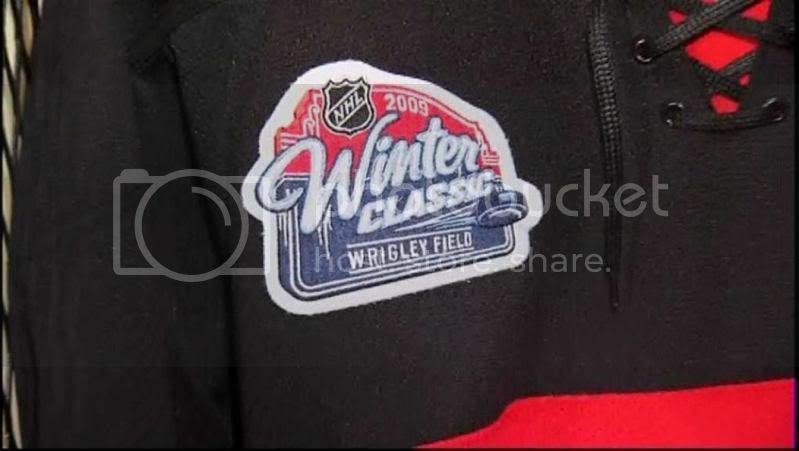 As a special treat for those tuning into this game, the Red Wings and Blackhawks will show off their Winter Classic uniforms tonight during an intermission. 8:30pm EST - Florida Panthers at St. Louis Blues: Fox Sports Network-Florida, KPLR in St. Louis. First in the Southeast vs. second in the Central. Gregory Campbell of the Panthers is questionable with a hip injury. 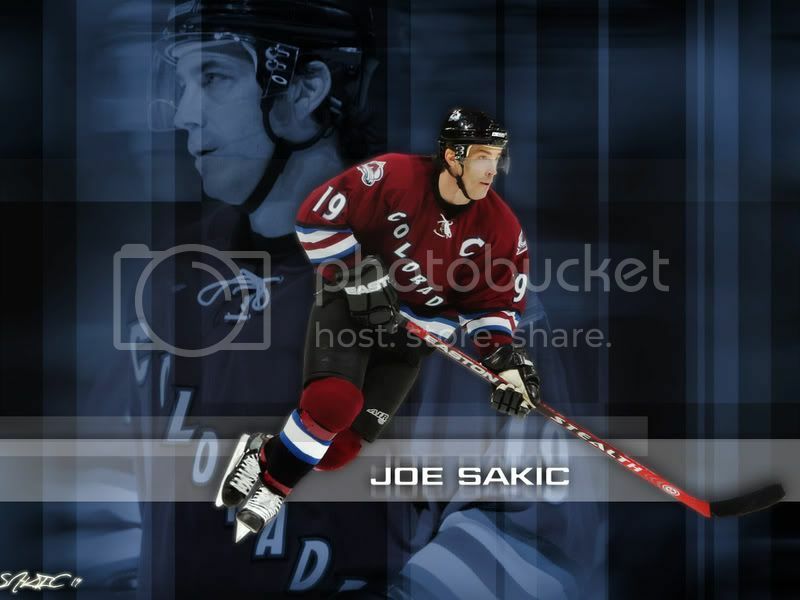 9:00pm EST - Buffalo Sabres at Colorado Avalanche: MSG-Buffalo, Altitude Sports in Colorado. First in the Northeast vs. second in the Northwest. David Jones of the Avalanche is questionable for tonight's game with an illness. 10:00pm EST - Edmonton Oilers at Vancouver Canucks: CBC nationally in Canada, NHL Network nationally in the US. Second vs. fifth in the Northwest. Steve Staios of the Oilers is questionable for tonight's game due to personal reasons. Darcy Hordichuk, Rick Rypien, and Sami Salo are questionable for the Canucks. Hordichuk is out with a knee injury, Rypien is out with an undisclosed injury, and Salo is suffering from a groin injury. 10:00pm EST - Calgary Flames at Phoenix Coyotes: AZTV in Arizona. Fourth in the Northwest vs. third in the Pacific. Viktor Tikhonov is questionable for the Coyotes with a shoulder injury. So there's the rundown of tonight's games. Get your remote out, and start channel surfing because there's a ton of NHL all over the television waves tonight. Heck, there's even a few AHL games on television today too. 4:00pm EST - Quad City Flames at Toronto Marlies: Rogers Sportsnet in Canada. 6:30pm EST - Chicago Wolves at Milwaukee Admirals: ComCast Cable in Chicago. 7:00 EST - Wilkes-Barre/Scranton Penguins at Portland Pirates: TWC in Portland, Maine. Grab yourself a couple of cold beverages, something to munch on, and get all of your hockey fix today. It's literally a buffet of hockey, and you can pick and choose which games you want to watch based upon their availability. It's good to be a fan of this game, isn't it? I'm sick. I have a head cold, and I really am struggling to stay upright. My nose is clogged, my head is pounding, and my body aches. 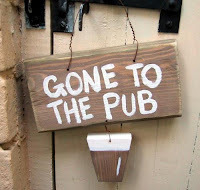 Despite my best hangover imitation, I'm shutting this place down for the day, and sending all the employees home. But before we do that, I will offer up some interesting news because, well, that's what we do on these sites. There are a couple of things to highlight, and one is a fabulous contest that anyone can enter. I'll do a quick run-down of all the major stories below. Let's get rolling before my head explodes. I was contacted by a gentleman named Vince yesterday in regards to a contest that is being run on the website he works for. Vince is the webmaster for Hart Designs, a website that features goalie masks custom-painted by Mark Hart. You can check a number of different galleries on his website to see his work, but the contest being held is a cool opportunity. Mr. Hart will customize a mask for you! There are some rules that I suggest you check out before getting in over your head, but if this is something you'd be interested in, sign up here and cross your fingers! Thanks for the info, Vince, and good luck to all that enter! The Edmonton Oilers will be holding their 4th Annual Caps for Cancer event on Monday. The Oilers have 10,000 pink and blue baseball caps that they will be selling with a player's autograph on each one. The funds raised from the sale of the caps will benefit the Canadian Breast Cancer Foundation, Kids with Cancer Society and charities supported by the Edmonton Oilers Community Foundation. 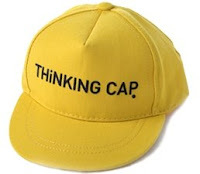 There is an online auction for some of the caps, and that runs through November 6. Last year, the Oilers raised over $200,000 for the various charities. This is a phenomenal way to raise funds to help communities, and I commend the Oilers for their program. Howard Shapiro, the author of Hockey Player For Life, has signed on with NHL.com to offer his books through the NHL.com website. This is a great opportunity for him as the NHL.com website receives a large volume of traffic daily. If you're interested in picking up a copy of Mr. Shapiro's book, please click here. If you'd like to purchase Mr. Shapiro's other book, entitled Hockey Days, please click here. Teebz's Book Club would like to point out that both of these books are suitable for children's reading, and that Christmas is coming up. Reward your hockey-loving child with one of these fantastic books. I received an email from a Miss Lyndsay Hoban who works for a PR firm representing Philips' Bodygroom line of products. This is entirely unrelated to hockey on the ice, but I guess it would qualify as a product one could use in the dressing room? Maybe Mike Commodore could be a spokesman? Anyway, I found the commercial to be pretty funny, so I thought I'd offer it up to everyone else in case they wanted to get one. You know... so you're not woolly like a Yeti. Or something. Check out "Bathrobe Guy" or the "Manalogues" for more info. I got a laugh out of it. Ok, so there are a few quick updates that should warm the cockles of your heart. If they didn't, at least you got some updates about people doing good. If I feel well enough after sleeping again, I'll be watching hockey tonight. And hopefully there won't be any other "oops" like Ryan Miller's mistake last night. At least it didn't cost Buffalo as they won in overtime. Buffalo still has no regulation losses in seven games. Impressive thus far. Short blog entry today. I'm far too busy to slave away with all the research and stuff that's required to write a long-winded blog about something that shouldn't happen for a long time. Of course, I'm referring to a second NHL team in Toronto. The idea was floated out there by a number of news sources, most notably David Shoalts of the Globe & Mail, but putting another team in Toronto is, to me, basic stupidity. Forget the jokes about the Leafs, having another team in Toronto would do exactly what the Maple Leafs don't want: a loss of revenue through a loss of market share. The NHL needs to start shoring itself up financially and in society. It has made inroads into cities like Washington where the Capitals are once again relevant thanks to a guy named Ovechkin. They have stars in Tampa Bay. The NHL has a stranglehold in Canada when it comes to hockey's market share, and it can't afford to let any of that share go. Places like Nashville, Atlanta, Miami, and Phoenix do need some help. The New York Islanders aren't doing so well either. But the NHL needs to start fixing the problems in these cities before looking at relocation. Relocation is an admission of failure in these cities. "I don't think it can be an expansion team," a governor said to Mr. Shoalts. "We can't expand because we would be the laughingstock of professional sports. "We've got too many troubled franchises. We've got to look at relocating a couple of them. These franchises were troubled long before the economic downturn and next year is going to be worse on them." As worse as its going to be for the American teams, the Canadian dollar slipped below 80¢ this week, meaning that the Canadian teams will now pay 20% more for their contracts than their American counterparts do. The Canadian teams are strong financially, but paying out $1.20 for every American dollar adds up quickly. The downturn in the economy will hurt everyone in North America. Moving another team to Toronto doesn't solve any problems - it simply relocates the same problems. As far as Toronto being able to support a second NHL team, they probably could. However, what becomes of the AHL's Toronto Marlies? They will still be the "family-affordable" professional hockey choice in Toronto, but, if there is another NHL team, the Marlies will lose out on some of those fans who normally show up for their games. The same goes for the OHL teams based in and around Toronto who already are competing with three other professional teams for fans. In this economic downturn, all of these businesses will feel the pinch as people's dollars are stretched further and further. Personally, moving a franchise to Toronto simply makes no sense during this time of unrest in the NHL. Franchises need to be stabilized, and the bleeding of red ink needs to be reduced significantly in some markets. Otherwise, this expansion/relocation in Toronto is nothing more than an academic exercise. And we've seen how well the big cheeses at the NHL offices have done with those in the past. I figured today would be a good day to get everyone caught up on that other league that plays across the ocean in a number of Russian and European cities. The KHL has seen a large number of media outlets and bloggers take issue with the league for the Alexei Cherepanov incident, and we still have no conclusive reasons as to why this young man passed away, but they have assured everyone that they are investigating all possible reasons for the tragedy. While this is going on, though, the hockey being played has been forgotten, so we'll take a look at what's been happening in the KHL up to this point. We'll work our way from worst to first. 23 - tie. Khimik Voskresensk: Khimik is sitting in last place right now with 14 points in 19 games played (3 wins-11 losses-0 shootout/overtime wins-5 shootout/overtime losses). Aleksandr Gorelov leads their defencemen in scoring with two goals and three assists in 17 games, while Denis Kartsev has three goals and four assists to lead the forwards in scoring. The problem looks like they need a much better defensive game. Their goaltenders have faced 542 shots in 19 games thus far, giving up an average of 29 shots-per-game. If your team can't score, you can't give up a ton of shots, and Khimik is doing that. 23 - tie. Dynamo Minsk: Dynamo Minsk has 14 points in 20 games (3-14-2-1) so far. Ben Klaymer (aka Ben Clymer) and Brayan Myuyr (aka Brian Muir) leads their defencemen in scoring with six points. Klaymer has two goals and four assists, while Myuyr has one goal and five assists. Andrey Mihalev leads the Minsk forwards in scoring with seven goals and one assist. Again, this is a team that just gives up too many shots while not taking enough shots. They have surrendered 525 shots thus far, while Endi Chiodo (aka Andy Chiodo) has tried to keep them in games. However, his 3.54 GAA and .868 save percentage indicate that this team needs some defensive help. Minsk has given up the most goals in the KHL this far with 72 GA. Offensively, they've been shutout six times in 20 games, so they could use some offensive help as well as they've only managed 36 goals total. 21 - tie. Vityaz Chekhov: Vityaz current sports a 2-9-2-6 record for 16 points in 19 games. Derrik Volzer leads their defencemen in scoring with three goals and four assists, while Aren Spaylo leads the forwards with ten goals and five assists. The problem with this team? Penalties. Vityaz currently has the most PIMs of any team in the KHL with 663, leading the next closest team by 229 PIMs. Goaltending hasn't been all that bad as Alexey Volkov has a 2.76 GAA with one shutout, but penalties will kill you. And it seems evident. 21 - tie. Amur Khabarovsk: Amur has a record of 4-13-1-2 for 16 points in 20 games. Alexandr Aksenenko and Vasiliy Turkovsky lead the way on the blueline for Amur with five points. Aksenenko has one goal and four assists, while Turkovsky has five assists. Oleg Belkin leads the way up front, recording five goals and seven assists. The goaltending is led by Tyler Moss, whose 2.65 GAA, .913 save percentage, and two shutouts suggest that this team should be better than what their record shows. The problem? 35 guys on the roster with numbers, and only 13 of them have scored goals. This team is offensively anemic, especially when you consider they've been shutout six times in 20 games. 20. HC MVD: HC MVD currently sits with a 4-11-3-1 record, good for 19 points in 19 games. Maksim Solovyev and Maksim Velikov are tied with seven points on the blueline. Solovyev has three goals and four assists, while Velikov has one goal and six assists. Up front, Alexey Tsvetkov leads with one goal and 13 assists. Mikhail Biryukov has steadied a team that was up and down earlier in the season by posting a 5-5 record with a 2.87 GAA and an .885 save percentage. MVD doesn't has the firepower that some of the top teams in the KHL do, but they should be a middle-of-the-pack team if they can continue to play to their full potential against some of the other mid-level teams. 19. Torpedo Nizhny Novgorod: Torpedo has a 6-12-0-2 record for 20 points in 20 games. Peter Podhardsky leads their defencemen with two goals and eight assists, while Mikhail Varnakov and Yegor Shastin share the lead for forwards with 13 points. Varnakov has eight goals and five assists, while Shastin has seven goals and six assists. The problem with Torpedo is that they appear to be a one-line team. Varnakov, Shastin, and Pavel Brendl have a combined 26 goals thus far. The other 22 guys have a total of 20 goals combined. Mika Noronen has played in 13 games, but his 2-8 record is nothing to be proud of. This team needs secondary scoring badly. 17 - tie. HC Sibir Novosibirsk: Sibir has a record of 5-8-3-3 for 24 points in 19 games. Defenceman Dmitriy Yushkevich is way out in front of the other defencemen on this team, having scored four goals and seven assists. Yevgeniy Lapin leads the forwards in scoring with nine goals and six assists. Tom Lawson has a goaltending record of 6-7, and has posted some excellent numbers with a 2.28 GAA, a .906 save percentage, and two shutouts. The problem? One line does the majority of scoring. Again, without secondary scoring, some of these mid-level teams will suffer against the powerhouses. 17 - tie. HC Lada Togliatti: Lada currently sports a record of 6-9-2-2 for 24 points in 19 games. Dmitriy Vorobyev leads the blueliners with three goals and seven assists. Konstantin Panov and Yevgeniy Ketov leads the forwards with 13 points each. Panov has eight goals and five assists, while Ketov has six goals and seven assists. Goaltending has been a toss-up between Mike Fountain and Vasiliy Koshechkin. Both have played ten games. Fountain has a 3-6 record with a 2.14 GAA and a .920 save percentage, while Koshechkin has a 4-5 record with a 2.24 GAA, .905 save percentage, and one shutout. Lada has scored 45 goals-for while only giving up 50 goals-against, so it appears that they win big, but lose a lot of close games. If Lada can turn this around, they could make up some ground in the KHL standings. 16. Metallurg Novokuznetsk: Metallurg NK is one of three teams that has played 21 games, and they've recorded 26 points on a record of 6-10-3-2. Marat Davydov leads their defencemen in scoring with three goals and five assists. Valeriy Klebnikov and Dmitiry Dudarev both have 13 points to lead the forwards. Klebnikov has four goals and nine assists, while Dudarev has three goals and ten assists. Metallurg NK is a balanced team with two solid scoring lines, and they've scored 57 goals thus far. Defensively, they look solid and get points from their defencemen while only giving 57 goals-against. Maksim Sokolov has a 5-6 record between the pipes with a respectable 2.58 GAA, .920 save percentage, and one shutout. If this team can put together a four- or five-game winning streak, they would find themselves in the upper echelon of the KHL standings. 13 - tie. SKA Saint Petersburg: SKA has a record of 7-8-4-0 for 29 points in 19 games. They are led from the blueline by Mark Popovik with four goals and three assists. Up front, they are led by Maksim Sushinsky with eight goals and ten assists. This is a team built on one solid scoring line, and a ton of team defence. Sushinsky, Nils Ekman, and Sergey Brylin have combined for 17 goals thus far, or about 39% of the goals scored by this team. They legitimately have an NHL defensive unit with Popovik, Raymond Giroux, Sergey Gusev, Kirill Safronov, Andrey Zyuzin, and Daryus Kasparaitis anchoring the blueline. Because of that, goaltender Robert Esh has a 7-6 record with a sparkling 1.84 GAA, .907 save percentage, and three shutouts. Backup goaltender Dmitriy Yacahnov is 4-2 with a 1.45 GAA, a .902 save percentage, and two shutouts. If SKA could get their secondary scoring going, this team could make a serious run in the standings. 13 - tie. Neftekhimik Nizhnekamsk: Neftekhimik is sitting with a record of 8-6-0-5 for 29 points in 19 games. Denis Sokolov has one goal and four assists to lead their defencemen, while one line leads the forwards in scoring. Andrey Ivanov has seven goals and three assists, Yevgeniy Lapenkov has five goals and five assists, and Dmitriy Makarov has three goals and seven assists. Neftekhimik plays in a lot of one-goal games, and they need to start winning some of them. Those five shootout/overtime losses are the difference between 13th spot in the standings and 5th spot in the standings. 13 - tie. Traktor Chelyabinsk: Traktor has only played 17 games thus far, and have a record of 8-5-1-3 for 29 points. Oleg Piganovich is way out in front of his defensive teammates with two goals and eight assists. Former NHLer Andrey Nikolishin leads the forwards with four goals and nine assists. This is a team that just takes too many penalties. They have 403 PIMs on the season so far, and four players have more than 30 PIMs on the season. With a team as talented as Traktor is, they could be much further up the standings with a little discipline. They have decent secondary scoring, but they need to tighten up defensively in front of goaltender Danila Alistratov to lower his 3.04 GAA. This is a team that is ranked third on the powerplay in the KHL, so they need to work on staying out of the sin bin rather than being in it. 12. Severstal Cherepovets: Severstal currently has 31 points in 19 games on a record of 8-7-3-1. Dzhoel Kvyatkovski (aka Joel Kwiatkowski) leads Severstal's defencemen in scoring with seven goals and two assists. Josef Straka leads their forwards in scoring with six goals and nine assists. Severstal has solid scoring as every player but one has recorded a point this season. They do need to tighten up their defence, though, as they have given up more goals than they've scored. Goaltender Rastislav Stana has a 7-2 record, but that doesn't reflect his 2.91 GAA or .894 save percentage. Those certainly aren't bad stats by any means, but lowering them will result in Severstal moving up in the standings quickly. 10 - tie. Barys Astana: Barys currently has a record of 7-8-5-1 for 32 points in 21 games. Along with Metallurg NK and Spartak, they have played the most games thus far, so there could be a few teams that move past Barys this week. Kevin Dallman is the Mike Green of the KHL, having scored 12 goals and five assists thus far. Konstantin Glazachev leads the Barys forwards in scoring with nine goals and ten assists. The problem is that everything on this team seems to go through Kevin Dallman. He leads the team in shots, game-winning goals, powerplay goals, and goals. When your top defenceman is more effective than your first-line forwards, there's a problem. Barys needs some additional scoring in order to keep them in the top half of the standings. 10 - tie. Dinamo Riga: Riga has a record of 9-6-1-3 for 32 points in 19 games. Filipp Novak and Dyui Vestcott (aka Duvie Westcott) lead their defencemen with eight points. Novak has two goals and six assists, while Vestcott has one goal and seven assists. Martsel Hossa (aka Marcel Hossa) leads the forwards in scoring with 12 goals and seven assists. Riga really needs Hossa on the ice more often than he is. Hossa leads the team in PIMs with 49, effectively handicapping his offensive totals. He does have five powerplay goals, but he needs to stay out of the box to be effective. Sergey Naumov has played in 11 games, and his 3.37 GAA isn't helping Riga move up in the standings. The goaltending and defensive play needs to improve for Riga to be a contender. 6 - tie. HC Spartak Moscow: Spartak has a record of 8-8-4-1 for 33 points in 21 games. Denis Baev leads Spartak's blueline in scoring with three goals and four assists. Branko Radivoevich leads the forwards in scoring with nine goals and 13 assists. Spartak could be much higher in the standings with some improved defensive play. Goaltender Martin Prusek has a 9-7 record, but his 3.06 GAA and .871 save percentage are hardly anything to write home about. If this team can improve defensively before the playoffs hit, they could be a sleeper pick to win it all. They have solid scoring with seven players in double-digits for points, so offence isn't a huge problem. It's keeping the puck out of their net that needs some improvement. 6 - tie. HC Dynamo Moscow: Moscow has put together an 8-5-4-1 record for 33 points in 18 games thus far. Karel Rahunek leads their defencemen in scoring with one goal and six assists. Maksim Pestushko leads Moscow's forwards with nine goals and three assists. Moscow is all about defence. They've scored 51 goals while only giving up 39 goals. However, they do need some additional scoring to keep their lofty position in the standings. They only have four players in double-digit scoring - a credit to their balanced attack - but they are the Minnesota Wild of the KHL. Defence comes first in every situation. 6 - tie. HC CSKA Moscow: CSKA has 33 points in 17 games thanks to a 9-4-2-2 record. Denis Kulyash has three goals and three assists to lead the blueliners. Sergey Shirokov leads the forwards with seven goals and nine assists. CSKA went through a tragedy earlier this season when Jussi Markkanen's son fell to his death from Markkanen's apartment. Markkanen only played in four games, going 3-1 with a 1.25 GAA, a .926 save percentage, and one shutout. Despite missing Markkanen, CSKA has weathered the storm and shown some resiliency. Getting Markkanen back before the end of the season could prove to be the move that makes CSKA a favorite in the KHL. 6 - tie. Avangard Omsk Oblast: Avangard got off to a horrible start, but have since put together a 10-7-1-1 record for 33 points in 19 games. Alexey Bondarev leads their defencemen in scoring with five goals and five assists. Yaromir Yagr leads the team in scoring with 12 goals and 14 assists. Of course, there's no denying that Avangard is a team in turmoil after Alexey Cherepanov's tragic death. Whether or not they can pull together will determine Avangard's final standing. However, they are getting good goaltending from Dzhon Grem (aka John Grahame) who is 7-4 this season with a 2.34 GAA, a .905 save percentage, and two shutouts. They have solid, balanced scoring, and look to be a favorite for the championship. But, again, their reaction to Cherepanov's death will be a telling factor. 5. Metallurg Magnitogorsk: Magnitogorsk has a record of 9-6-3-1 for 34 points in 19 games. Vitaliy Atyushov leads the blueliners with three goals and ten assists. Jan Marek is tearing up the league with 18 goals and 11 assists. Andrey Mezin and Ilya Proskuryakov have split the goaltending duties, and both have respectable statistics. Where Magnitogorsk needs to improve is in their overall scoring and team defence. Marek has scored one-third of Magnitogorsk's goals this season, and that reliance on his scoring can't happen if Magnitogorsk wants to go far in the playoffs. Defensively, Magnitogorsk has given up the most goals of the five top teams, and they need to tighten up their defensive system in order for them to improve on their current standing. Magnitogorsk looks solid, but they need to improve their secondary scoring and defensive responsibility. 4. Lokomotiv Yaroslavl: Lokomotiv has posted a record of 11-5-0-2 record for 35 points in 18 games. Alexandr Guskov leads the defencemen in scoring with five goals and five assists. Konstantin Rudenko leads the forwards with four goals and ten assists. Lokomotiv has a balanced scoring attack, and play solid defensive hockey. Their 26 goals-against is second in the KHL to only Salavat Yulaev Ufa, and their goaltending is solid. Georgiy Gelashvili is 10-6 with a 1.81 GAA, a .933 save percentage, and two shutouts. Lokomotiv could benefit by hitting the scoresheet more often as only four players are in double-digits for points, including Alexey Yashin who has four goals and six assists. However, their defence-first ideology seems to be working, so I can't really recommend any changes for this team. I'm thoroughly surprised that someone has Yashin playing defence-first hockey, and keeping him happy while doing it. That's an accomplishment in itself. 3. Ak Bars Kazan: Kazan has jumped out to an 11-3-2-2 record for 39 points in 18 games. Ilya Nikulin leads Kazan's defencemen with three goals and ten assists. Alexey Morozov is leading the forwards with nine goals and 13 assists. Kazan has played solid hockey thus far, getting contributions on the scoresheet from every line. Stanislav Galimov is 6-0 in seven games this season with a 2.00 GAA, a .919 save percentage, and two shutouts. Ueyd Dubelevich (aka Wade Dubielewicz) has provided solid backup goaltending for Kazan, posting a 7-4 record with a 2.80 GAA and a .888 save percentage. Kazan's overtime record is 1-2 thus far, and could prove to be crucial when points matter late in the season. 2. Salavat Yulaev Ufa: Ufa has a record of 13-3-2-1 for 44 points in 19 games. Kirill Koltsov leads the Ufa defenders in points with three goals and eight assists. Alexey Teryeschenko leads the forwards with five goals and 13 assists. Along with Alexandr Perezhogin and Aleksandr Radulov, Ufa's top line is one of the best in the KHL. Radulov, however, needs to start playing with some discipline as he leads the team with 42 PIMs. Ufa's balanced attack is complimented by their solid team defence. They have only surrendered 32 goals this season. Alexandr Yeremenko is 10-2 on the season with a 1.59 GAA and a .941 save percentage, while backup goalie Vadim Tarasov has a 4-3 record with a 1.67 GAA, a .924 save percentage, and one shutout. Ufa appears to be a very solid team, and should be considered a favorite for the KHL championship. 1. Atlant Mytishchi: Surprisingly, Atlant is the top team in the KHL thus far, sporing a record of 14-1-2-2 for 48 points in 19 games. Magnus Johansson is tied for the lead in defenceman scoring with Kevin Dallman, having recorded four goals and 13 assists. Sergey Mozyakin leads the forwards with nine goals and 17 assists. This is a team with balanced scoring and solid defensive play. They have nine players in double-digits for points, and only have one player in the minuses for plus/minus. 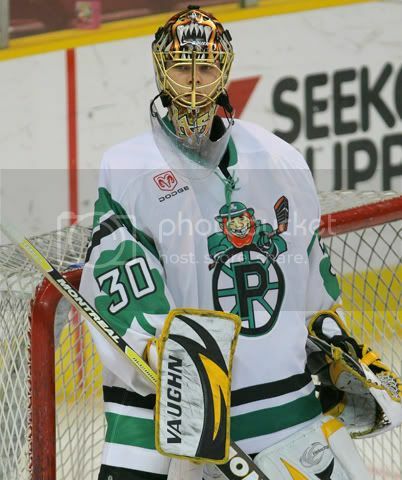 Raymond Emeri has a 6-3 record with a 2.38 GAA and a .926 save percentage. However, Atlant's other goaltender is the best in the KHL right now. Vitaliy Kolesnik is 7-0 with a 1.19 GAA, a .955 save percentage, and three shutouts. In 12 appearances, Kolesnik has only surrendered nine goals. Atlant has no glaring holes whatsoever. They lead the KHL in powerplay percentage at 22.9%, have no shorthanded goals-against, and rank eighth in penalty killing percentage at 86.0%. They have the most even-strength goals with 50, and rank first in the KHL with 4.0 goals-per-game. Atlant has to be the favorite to win it all in the KHL due to the solid team game they play. So there you have it. The KHL season is rolling, and there are a number of stories already being written. Again, my condolences and thoughts go out to Alexey Cherepanov's family, friends, and teammates for their loss. It would be an amazing story if Avangard could win the KHL championship in memory of this upstanding young man. Last night saw the Montreal Canadiens play host to the Florida Panthers at the Bell Centre. Florida had not lost in Montreal since January 2003, so there was a streak on the line. Montreal, looking like a team on a mission, came out and scored some timely goals to defeat the Panthers by a 3-1 score. However, the Habs came out in their 1970-71 era jerseys, and looked solid while wearing white at home. Koivu, Bouillon, and Plekanec scored for Montreal while Keith Ballard had the lone Panthers goal. Montreal has yet to lose in regulation. Let's check out some other news. Despite their loss to the Canadiens last night, the Florida Panthers remain as the only team of the NHL's 29 exisiting teams to have a winning record against the Canadiens. The Panthers have a record of 25 wins, 17 losses, six ties, and five non-regulation losses against the Canadiens all-time. Is anyone else sick of Sean Avery's garbage yet? Brett Hull and Jeremy Roenick would routinely speak their minds when they got the chance, but at least they were respectful of other players for the most part. Avery needs to realize that he's not bigger than the game. Officially, I will not speak about Avery on this blog again unless he's suspended for something stupid. Which means I'll probably talk about him before the season is over. The entire Dave Berry controversy over at Covered In Oil is a huge story, but it's one that I really feel should be laid to rest. The facts? Dave broke the rules, and the Oilers were rude in regards to his punishment for breaking their rules. Whether Dave gets an apology or whatever is totally between those parties now, and that's final. What we bloggers have to realize is that we're on the outside because we're not credentialed. Should we be? That's another debate altogether. But for the time being, NHL bloggers need to realize that if you bite the hands that feeds you, you'll never get any sort of bone thrown your way. I fully endorse supporting Dave and his cause, but don't be rude when it comes to the Oilers or the NHL. Two wrongs, after all, don't make a right. Mc79Hockey has a fabulous take on the entire debacle - highly recommended reading. I don't subscribe to Facebook, and I really have no desire to. But if you do, use your head. Especially if your photos aren't set to private. Case in point? Mike Commodore. I am scarred for life by that picture. Puck Daddy examines the photo CSI-style. With the Seinfeld College Tour currently visiting campuses around the continental United States, you have a chance to check out the jersey that Patrick Warburton wore as David Puddy. Devils vs. Rangers... such good memories. In non-hockey news, you can also check out the Top Ten Hottest Women that George dated. All I gotta say is "why can't I be George"? He dated some beautiful women! Speaking of beautiful women, the University of Kentucky men's hockey team probably has the best schedules in the world. I'll run through these year by year: Ashley Judd (actress), Rebecca Gayheart (actress), Leah Lail (actress), Julie and Shawnie Costello (actresses), Kylie Bax (model/actress), Amy Hayes (female ring announcer in boxing), Alison List (model), and Tara Connor (former Miss USA). If you want to sell tickets, that's a pretty good way to do it. 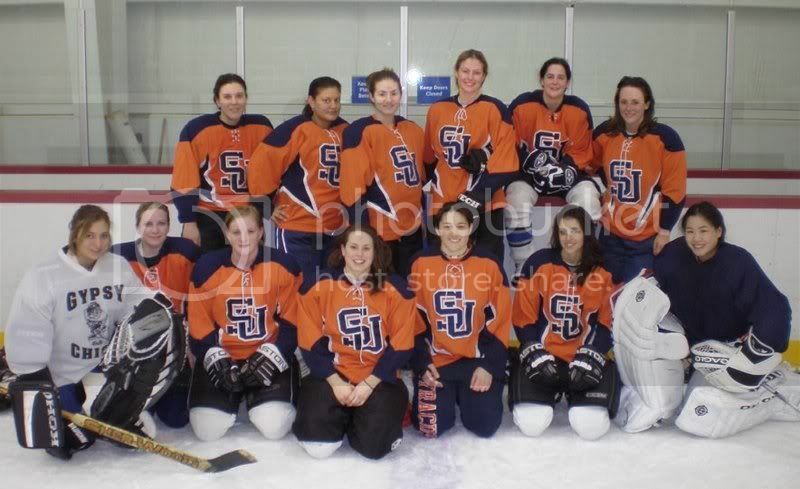 Continuing on the topic of women and hockey, the Syracuse University's women's ice hockey team will play its first-ever home game on Friday, October 31 against Sacred Heart. The Orange are currently 1-6 on the season, having lost their first six games before shutting out Quinnipiac 2-0 this past Saturday. If you're in the area, head down to the Tennity Ice Pavilion and show the women some support. The women will also cross the border into Canada for a few games. November 29 has them in Ottawa to play Carleton University, November 30 takes them to the University of Ottawa, and February 24, 2009 sees the Orange square off against the reigning CIS champions, the McGill Martlets, in Montreal. This doesn't really count as a headline, but I need to give a shout-out to a few new or changed blogs on the drop-down list. FlyerFlies, a superb Flyers site, has updated a link to their blog. The Notwithstanding Clause has been added. TNC covers the Canadiens. Fresh From The Ice covers the Dallas Stars, and it's a solid blog. Mark's Musings covers a number of sports, but he's a Washington Capitals fan. Check these guys out for some more info on those teams! It's worth the click! There are the latest headlines from the hockey world. I'm sure there are a pile more that I could have touched on, but these ones are what kept me reading all week. Marty Turco finally got me a win without giving up a dozen goals, so I'm much happier with his performance last night in New York as well. Today, we're going to perform a little history lesson on Hockey Blog In Canada. As you may have read throughout the various articles I've posted on here, I am a fan of the New York Islanders' controversial Fisherman jersey. I always was a fan of the jersey, despite me hating the team thoroughly since David Volek wired a slapshot past Tom Barrasso in the Patrick Division Final of the 1993 Stanley Cup Playoffs, thus ending the Penguins' chance at becoming the first back-to-back-to-back Stanley Cup winners since the Oilers of the 1980s. 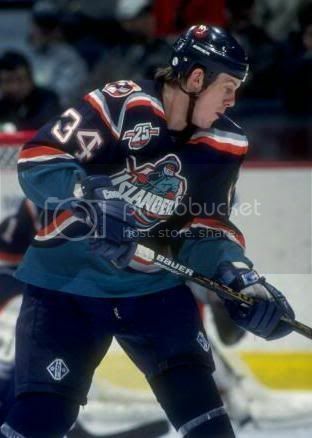 However, when the Islanders introduced those sea-sickness jerseys, I instantly gained an iota of respect for them. It takes some nerve to wear something that ugly. Thanks to Paul Lukas of Uni Watch Blog, he pointed me in the direction of Chris Botta. Mr. Botta writes a blog entitled NYI Point Blank. Mr. Botta was the team's former longtime media relations Vice President, and he went through the Fisherman years in his position. It's from this perspective that he wrote an article on his blog on Sunday that sums up exactly why the Fisherman jerseys were "a disaster". To read Mr. Botta's article, please click here. 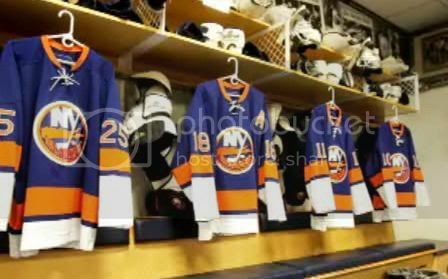 Personally, it's a very well-written article, and it explains a lot of the reasons why the Islanders scrapped the Fisherman jersey. I mean, when Mike Milbury looks like a deer in headlights at a press conference, you know you have trouble. Wait, didn't he always look like that when trading away guys like Wade Redden, Olli Jokinen, Roberto Luongo, Wendel Clark, Todd Bertuzzi, Jason Spezza, Zdeno Chara, Zigmund Palffy, Eric Brewer, and Chris Osgood? And because of his mismanagement with Luongo, was forced to draft Rick DiPietro over Dany Heatley? Ouch. Again, I understand the outrage that people had when the Islanders introduced this new jersey and logo. The Islanders had been extremely successful in their franchise's short history in winning four Stanley Cups. Guys like Mike Bossy, Denis Potvin, Butch Goring, Bryan Trottier, Clark Gillies, Billy Smith, and Pat Lafontaine wore the traditional Islanders colours, and those colours were a point of pride for Islanders fans. I just can't hate the Islanders for wearing the Fisherman. They were years, even decades, ahead of their time. As a radical change, they would have been phenomenal alternate jerseys in my opinion. 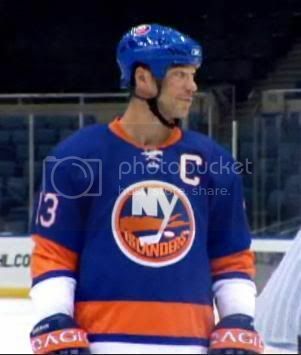 Much like what Edmonton did with their former alternate jersey in making it significantly different from their normal jersey, the Islanders could have done the same with the Fisherman. The dramatic change of swapping out the traditional with something completely different is a huge impact on the fanbase, and the jersey introduction should have been done slowly. I'm never going to say that I hate the Fisherman. I don't. It's a phenomenal jersey. But to have people say that they hate it specifically because it is different is irrational. It's a part of your history, Islander fans. Love it. Embrace it. Commit to the Fisherman, Islander fans. It's not as bad as you once thought it was. I guarantee it. And Mr. Botta, you have nothing to be embarrassed about. It was a dark period of the Islanders' history, but the jerseys alone were not the reason why the Islanders plunged into darkness. The jerseys sparked more debate about the Islanders over the two years that the Fisherman was around than anything else that the Islanders have done in recent memory. And the worst part about being talked about is not being talked about. Teebz's Book Club and Hockey Blog In Canada is proud to present another book that is rich in sports history. 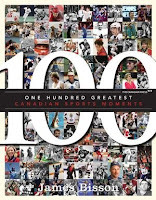 Today, HBIC is proud to present One Hundred Greatest Canadian Sports Moments, written by James Bisson and published by Wiley. Whenever someone speaks of Canadian sports history, you know hockey is going to be involved. The number of historical games that Canadian hockey teams have been in are numerous, but this book narrows it down to how significant some of those games were. Honestly, the history in the book of all sports played in Canada is impressive, and Mr. Bisson does justice to Canadian sports fans by covering them all in a Top-100 format of how significant these events were. James Bisson "has been a reporter-editor for The Canadian Press newswire service since 2001. He also spent four years as an editorial assistant with The Score, an all-sports television network. HIs work has appeared in nearly 100 Canadian newspapers and he has covered over a different types of sports, including: NHL hockey, NBA basketball, Major League Baseball, PGA golf, Champ Car open-wheel auto racing, the 2005 Canada Summer Games in Regina, the 2007 Canada Winter Games in Whitehorse, the women's World Curling Championship, CFL football, and WWE wrestling". Pretty impressive resumé, I must admit. Clearly, though, Mr. Bisson has the experience in a number of sports to be able to comment on the top moments from Canadian sports history. In the book, Mr. Bisson actually covers over 25 sports in the 100 moments, including such sports as figure skating, tennis, swimming, athletics, rowing, soccer, snowboarding, and others. A lot of the examples come from the world's greatest sports stage: the Olympic Games. The pictures are rich and vivid, and each moment comes with a great article describing how that moment should be remembered. The list of athletes covered in the book are a "who's who" in terms of Canadian sports history: Terry Fox, Rick Hansen, Wayne Gretzky, Bobby Orr, Elizabeth Manley, Dave Stieb, Vince Carter, Steve Nash, and Mike Weir but to name a few. What will generate discussion amongst everyone who picks up the book is where these sports moments should rank in terms of the Top-100. In terms of hockey moments, where do the Canadian World Junior teams rank? Where does the last all-Canadian Stanley Cup Final between Calgary and Montreal rank? Does Montreal's Stanley Cup run in 1993 make the cut, especially considering the ten overtime games they won? Does Sidney Crosby make the book with his short history of being in the spotlight? Is the Salt Lake City Olympic gold medal for the men's hockey team the greatest Canadian moment? What place does the Summit Series fall in at, considering the magnitude of Paul Henderson's historical goal? Does Henderson get his own moment? All of these questions are answered in the One Hundred Greatest Canadian Sports Moments. The foreword, written by CTV's and TSN's Brian Williams, speaks about how Canadian sports is larger than just hockey. He speaks about how the entire Canadian population can tell you where they were when Paul Henderson scored against the Russians in 1972, where they were when Ben Johnson won the gold medal in 1988 in the Seoul Summer Olympics and then taken away days later, where they were when Donovan Bailey won the gold medal for the men's 100-metre race in the Atlanta Summer Olympics. The most important part that Mr. Williams touches on is how sports arouses passion and initiates great debate. As a hockey fan, I can certainly agree with Mr. Williams as I looked for the hockey moments during the first time I flipped through the book before going back and reading it cover-to-cover. Much like McCown's Law: The 100 Greatest Hockey Arguments, this book will certainly stoke the fire of the passion we have for sports in Canada, and it will undoubtedly bring back memories of where you were when some of these moments took place. Mr. Bisson's work in this book is impressive. The historical descriptions of events takes you back to the event, while the minute details help to build the second-by-second replay of the moment. It's this detail that makes the book so amazing, and makes me smile as a Canadian as I recalled these events. One Hundred Greatest Canadian Sports Moments is a fabulous book for sports history fans, is suitable for all ages, and certainly deserves the Teebz's Book Club Seal of Approval. Well done on a wonderful book, Mr. Bisson! 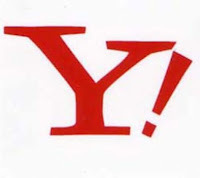 That Yahoo logo is quite meaningful to me today. The emphasis of an exasperated "why" is all I have for one of my fantasy goaltenders. Simply put: he is stinking the joint up. And I have no explanation why. It's one thing if you're a career backup thrust into the spotlight due to an injury. I can understand if you feel some pressure and may not play up to par. But for a starter to turn in the kind of season that Marty Turco is working on takes some serious lack of everything. And he's absolutely killing my fantasy hockey team with his crap-tastic play. We're talking about a guy who has average about 36 wins per season, but has recorded one win in five games thus far. We're talking about a guy who has a career 2.17 goals-against average, but is sitting on a 4.70 GAA as you read this. This is a goalie who has a career .912 save percentage, but can't stop more than 83% of the shots he faces this season. What the heck happened to Marty Turco over the summer?!? All I know is that he's killing my goaltending stats in my fantasy pool. I'm a Marty Turco fan as well, and I thought he may have had a chance to solidify a spot on the Canadian Olympic team with his usual strong play. Roberto Luongo and Martin Brodeur have to be the favorites to tend the nets in Vancouver, but I could se Turco as the alternate due to his normal strong play. After watching him swim in his net this season, I'm not so sure about his appointment to the team. Heck, he hasn't helped his NHL team very much this season as Dallas has struggled to a 1-3-1 record for fourth in the Pacific Division. Something has to change in Dallas. I'm not saying that head coach Dave Tippett should sit him, but something needs to change fast. I could play net and post a 4.70 GAA for Dallas. Just leaning a goal stick against the crossbar may do better. All in all, Dallas needs someone to step up. More importantly, I need Turco to step up. I am suffering because of him, and I'm almost tempted to dump his crappy play and poor statistics for someone else. But his career stats lead me to believe he can turn this around. So I'll hold on to him. For now. I like challenges. They make me think outside the box, and that's good for my mental stimulation. Keeping your mind sharp is good in general, so it should be encouraged. Crossword puzzles, Sudoku puzzles, cryptoquips, and other simple games that challenge the mind to figure out a problem always get my creative flow working, and I feel pretty good when I solve one of these puzzles. So when I found a few NHL mind puzzles on Mental Floss, I had to go with these as a way to kill a brighten a few bulbs out there. I'm sure you'll do well, and I'll post my scores so you can take a shot at a real challenge. Not bad, eh? 30 teams in just under two minutes. That's a fair challenge time. I kind of have an advantage since I watch Grapes regularly, but see if you can match my score. I will be busy most of the day tomorrow, but I'm taking holidays from work to kick back and do a little relaxing after how busy I've been this past month. That means I can ramp up my articles and put some serious time on the books for HBIC. After tomorrow, I'll have a pile of extra time to write! - huge props to DC Sports Chick for the first link. You can find her on the incomparable On Frozen Blog! It's been a while since I ran through some hideous or awe-inspiring jerseys. 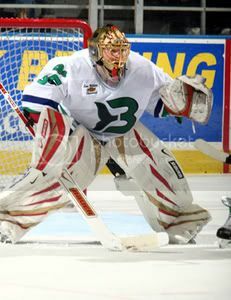 I figured that since the NHL was going gung-ho with their new alternates, we might as well take a look back at former alternate jerseys, as well as some other promotional jerseys worn in the various minor leagues. Of course, we'll still be previewing any new jerseys that NHL teams unveil, but this is more a look at what was. Or what should never have been. Honestly, some of these jerseys are very well done, while others are... well, you can finish that sentence yourself. In any case, these articles are a fun way to look at what teams are doing for promotions, and they usually result in some great comments, so feel free to add your thoughts. Please note that this will not cover vintage jerseys or throwbacks that weren't specifically used as alternates. Here is Chapter Seven of the You're Wearing That? series. 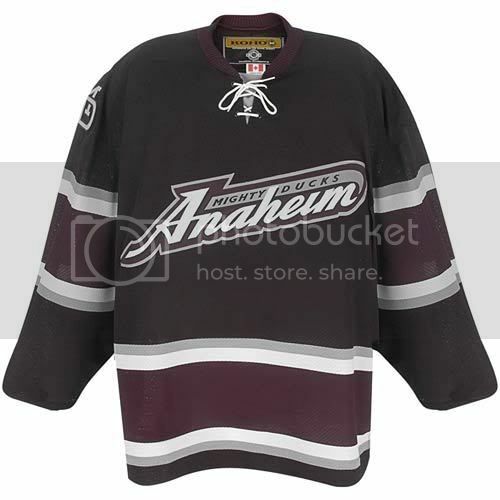 The Anaheim franchise has worn a number of alternate jerseys over their short history. There was the Nike phase where they wore a white alternate and dark alternate jersey that looked slightly modernized. They aren't bad, but they aren't all that special either. 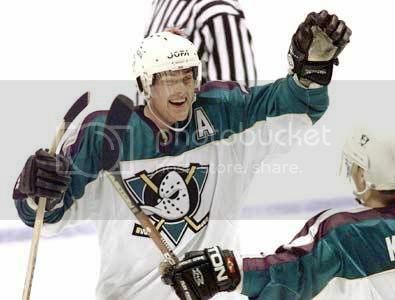 The Ducks also wore a black alternate jersey that used a wordmark on the front rather than a logo. 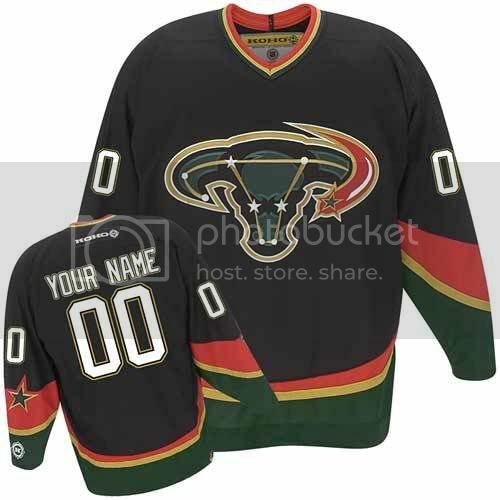 The most cringe-inducing jersey of them all was the Wild Wing jersey. 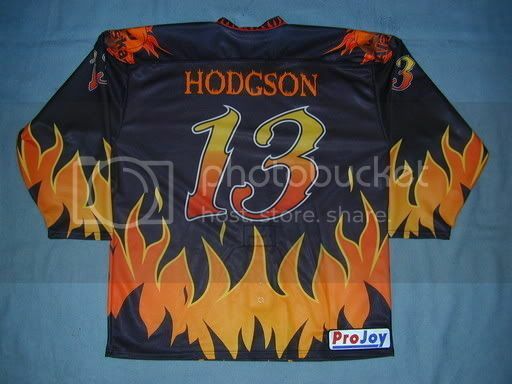 The front was absolutely horrific, but the font on the rear of the jersey only added to the atrocity. Simply ridiculous. 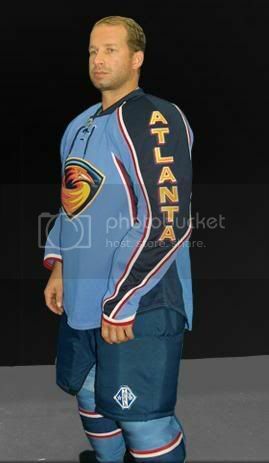 The Atlanta Thrashers are using their former alternate jersey as their current home jersey. Yes, it still looks stupid. Yes, I still don't like it. What was wrong with this jersey? 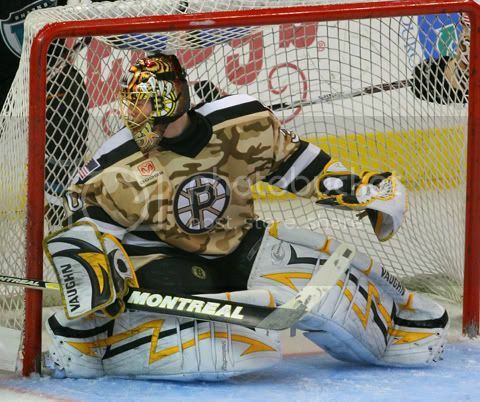 The Boston Bruins only had one alternate jersey, and that was Team Pooh Bear. I'm not against yellow jerseys if they are done right, but there is just so much wrong with this jersey. Of course, during the NHL's 75th anniversary, the Bruins wore their throwbacks when playing against the other Original Six teams, but these weren't true alternates. The Buffalo Sabres used an alternate when they were in Angry Bison Head mode. 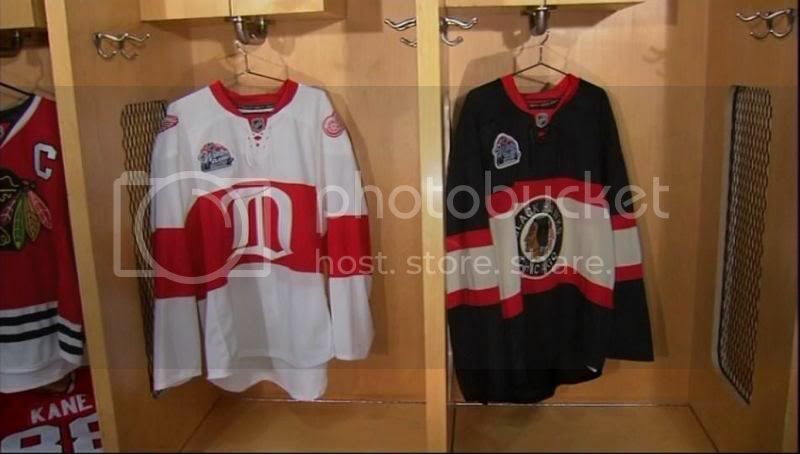 These are decent alternates mainly because they have that decent Sabre logo. I'm not so fond of the red colour, but the logo is decent. The Calgary Flames went a little crazy when they introduced the flaming horse head on a black background. I was never a fan of these jerseys. It just felt a little bit too NBA for me. 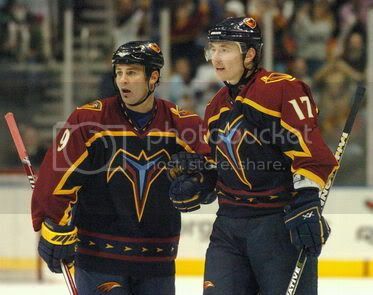 Of course, the Flames made these their home jerseys in 2000-01, eliminating the red jersey from their jersey set. They brought a red jersey back in 2003-04, and the hockey world gained some sanity again. The Colorado Avalanche thought they could be the New York Rangers for a few seasons by wearing an alternate with "Colorado" written diagonally across the jersey. It lacks imagination, and I'm not a fan. I prefer their snow-capped "A" logo. 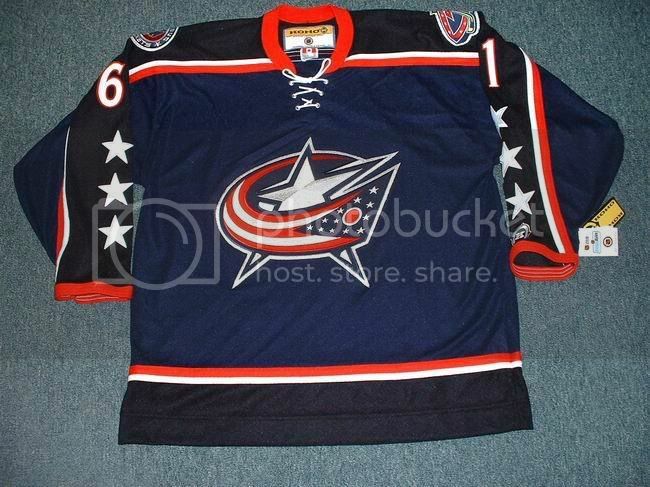 When the Columbus Blue Jackets still thought they were entomologists, they introduced an alternate jersey in 2003-04. Of course, this alternate was the prelude to their current jerseys, and it looks pretty good. No loss here for the Blue Jackets. The Dallas Stars originally introduced their former road jerseys as an alternate jersey in 1997-98. 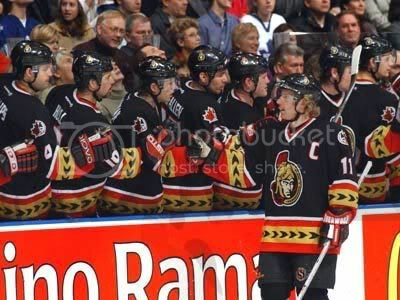 In 1999-2000, they ditched the solid colour jerseys for the star design. However, they had plans to add another jersey in the star design mold. 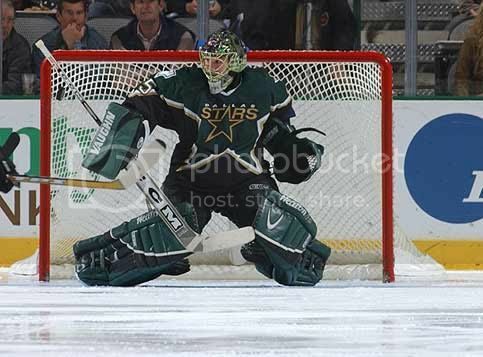 In 2002-03, the Stars were supposed to introduce a gold-coloured jersey as an alternate. They had begun selling replicas before someone decided to scrap the design. If you're lucky, you can catch one on Ebay every once in a while. Dallas' worst idea yet might the Female Reproductive Tract alternate jersey. It was born and died in the 2005-06 season. Simply offensive. In 2001-02, the Edmonton Oilers made a radical decision to let Todd McFarlane create their third jersey. And it's one that I absolutely love. That jersey was one of the most popular during its time, and routinely was one of the NHL's best-selling pieces of merchandise. I would love to see it make a return. 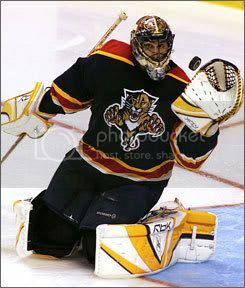 I'm not sure why the Florida Panthers came up with a blue alternate jersey, but they did. It's a lot of blah in its lack of creativity. Ironically, the blue jersey replaced their traditional red jersey during the 2003-04 season. And this led them to introducing a blue home jersey last season with the Reebok design. Because, you know, Florida panthers are blue in nature apparently. 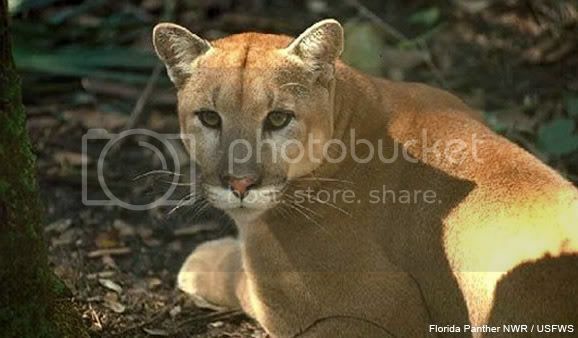 Has anyone in Florida ever seen a Mountain Lion? Because that's what a Florida panther is. 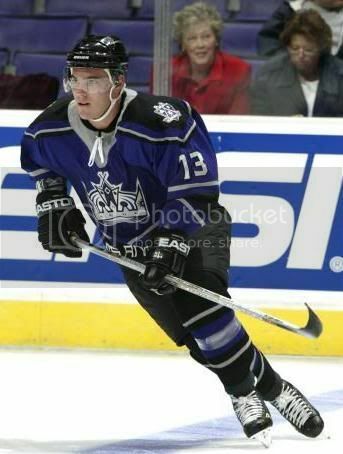 The Los Angeles Kings are probably best remembered for the Burger King jersey as their alternate. 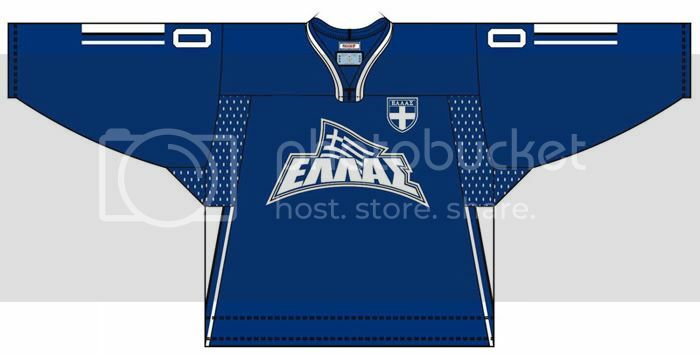 These are horrible, and they look like a beer league hockey team uniform. Of course, they've also worn a purple version of their previous uniforms as an alternate jersey. The large silver crown makes it easy to spot the alternate. The Minnesota Wild were popular due to their green-and-red alternate jersey, prompting some to jokingly call them the Skating Christmas Trees. However, the new alternate was so popular that they ditched the traditional green uniform and kept the red jersey as their home outfit. 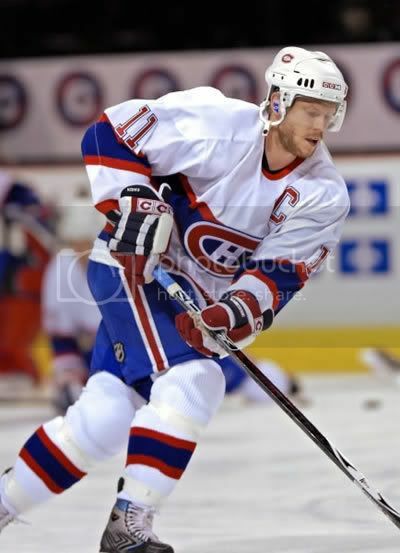 The Montreal Canadiens wore a retro-style alternate jersey for the 2006-07 season only. I like the look of this jersey. Very classy. 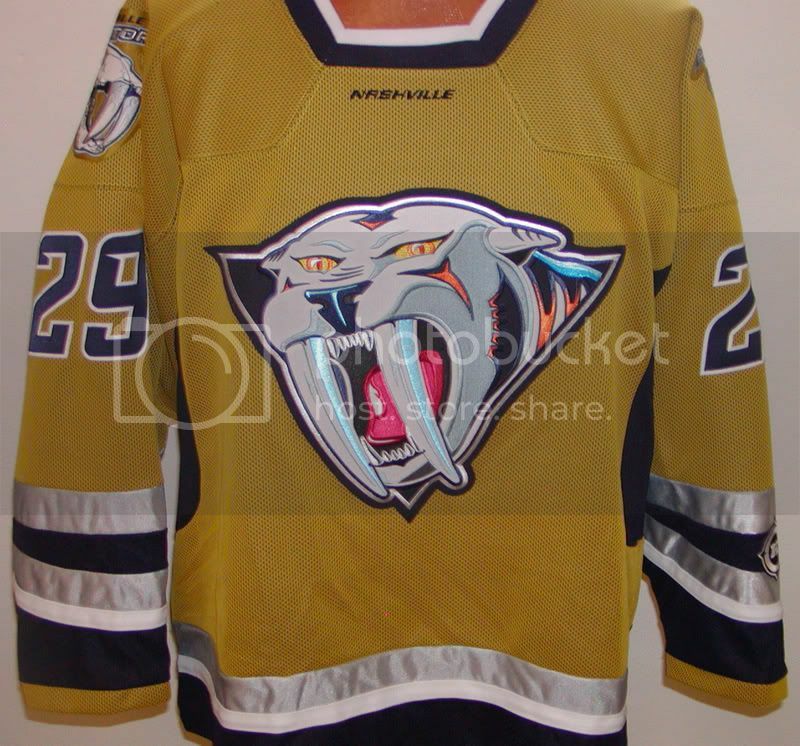 The Nashville Predators wore baby puke greenish-yellow for a while. I hated it. I will not talk about it. Don't even ask. 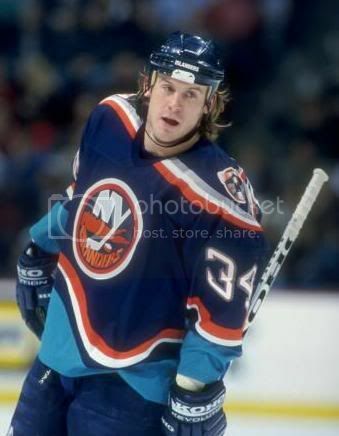 The New York Islanders opened the 1995-96 season wearing one of my favourite jerseys in the Fisherman. However, public outcry for the Islanders' traditional logo forced the franchise to convert their jerseys back to the Isles' regular logo midway through the 1996-97 season as an "alternate". Except their alternate was worn all the time. In 1998-99, the Islanders scrapped the "wave" jersey altogether and went back to their normal jerseys. I'm disappointed by this move, but I got mine, so I can continue to commit to the Fisherman. And how can we forget about the New York Pylon-ders? I'm glad that alternate jersey went the way of the dodo. The New York Rangers are probably best known for their Lady Liberty alternate jerseys that came in white and dark blue. Check out Gretzky's white skates matching his white jersey in that photo! 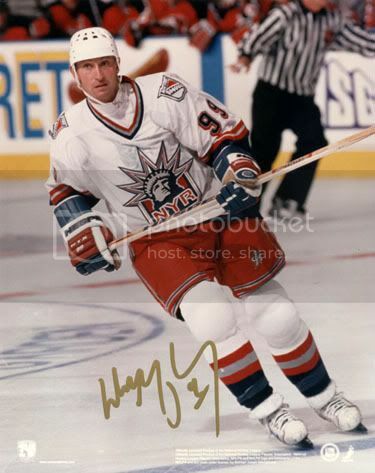 The white Lady Liberty jersey was only worn during the 1998-99 season. 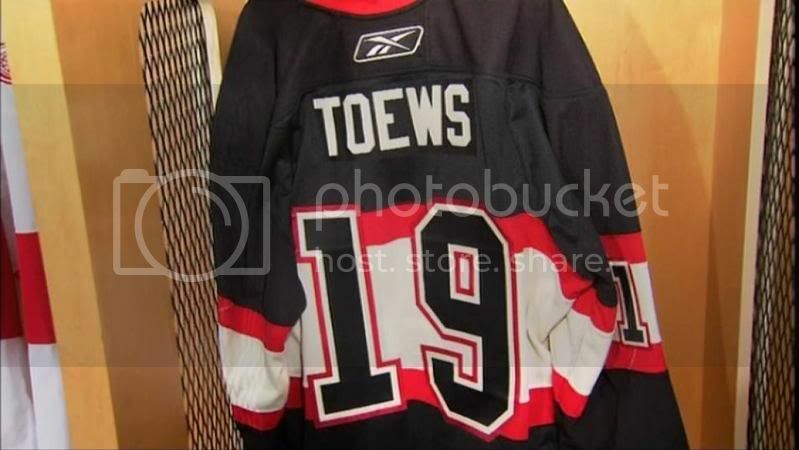 The Ottawa Senators brought forth an alternate jersey with a new Centurion's face in 1997-98. In 1999-2000, the red alternate replaced the road black jersey. 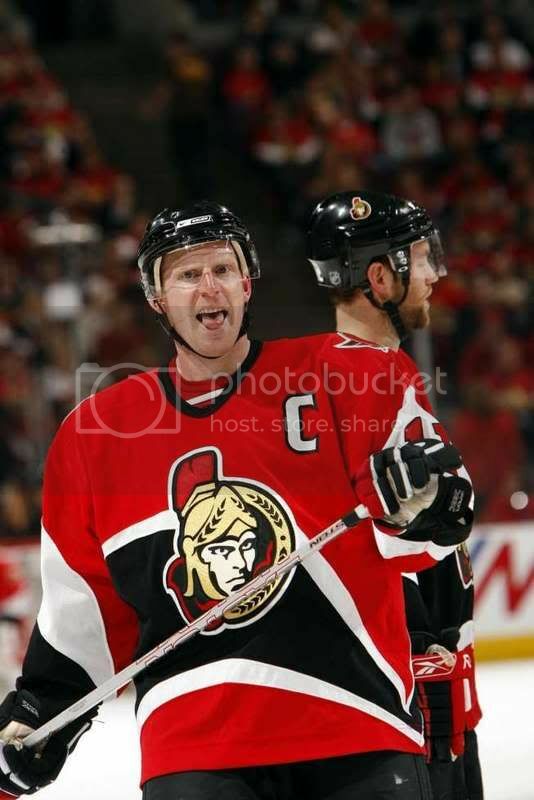 Feeling slightly left out, they brought the black back as a new alternate jersey in 2000-01. The Philadelphia Flyers introduced a black alternate jersey in 1997-98. 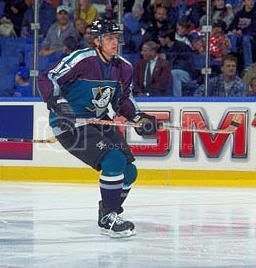 Like a lot of other teams, they pushed their traditional orange jersey off the boat in 2001-02 and went with black as their road jersey. And because they felt a little lonely without an alternate, they brought back a new orange alternate. That seems a little ridiculous, no? 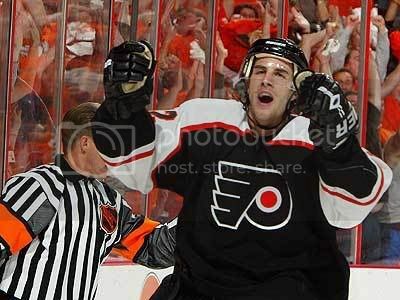 I abhor the stylized Flyers logo with the silver accents on that alternate jersey. 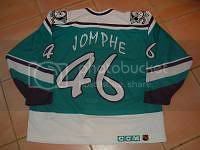 The Phoenix Coyotes introduced an alternate jersey in 1998-99. Personally, I'm not a fan. 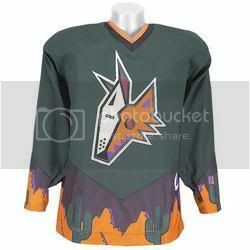 But the Coyotes decided to tinker with the look of the alternate, making it more hideous. This alternate look was put to death after the 2002-03 season. The Pittsburgh Penguins were a team of changes. In 1995-96, the Penguins brought forth some gray striping in their new alternate jersey. Like the two teams above them, they turned this alternate into their road jersey for the 1997-98 season. The Penguins decided to bring back the skating penguin logo in 2000-01 after Mario Lemieux assumed control of the team. 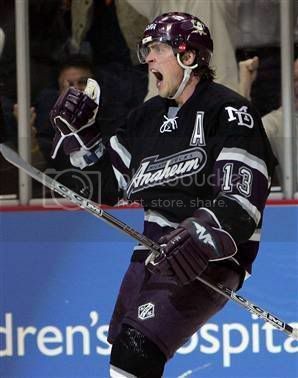 This jersey was an alternate jersey until 2002-03 when it bumped the gray-striped jersey from the jersey set. I like both of these jerseys, but the skating penguin is timeless. 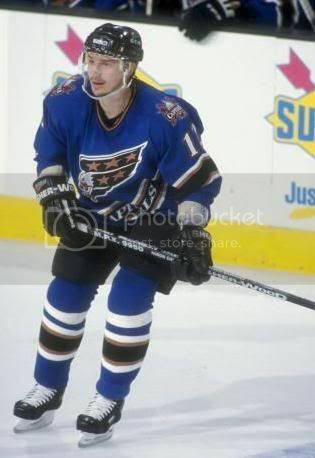 The St. Louis Blues, like the Dallas Stars, never got to show off their alternate jerseys. 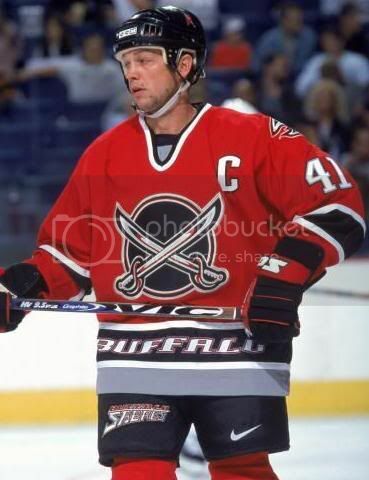 Mike Keenan refused to let his team play in their alternates in 1995-96 due to their hideousness. For once on this blog, I applaud Mike Keenan's decision. 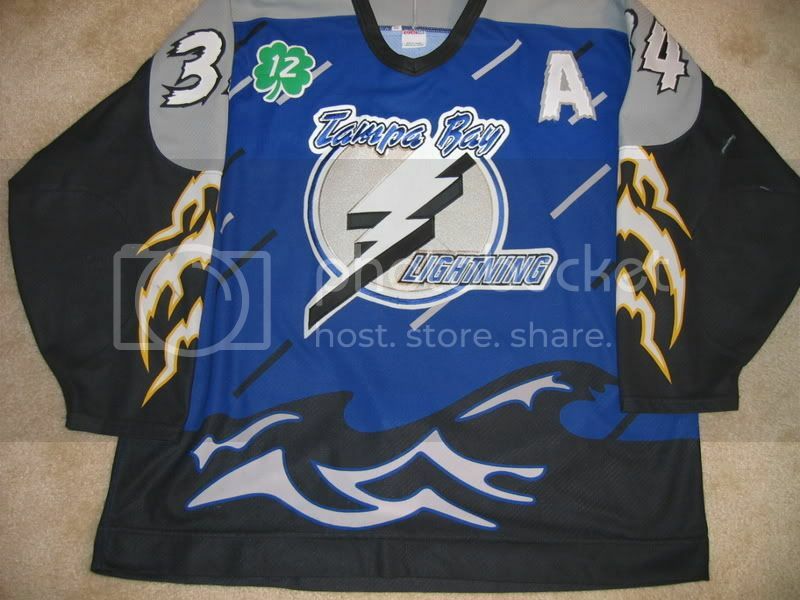 The Tampa Bay Lightning decided to ramp up the storm on their jersey - literally. The alternate jersey they debuted in 1996-97 actually has lightning on the arms and simulated rain. This could have been the start of that other Southeast Division team, the Carolina Hurricanes. Even the font was brutal. They didn't make it past the 1998-99 season. The Vancouver Canucks are a team of many faces. We'll start with the 1995-96 season where the Canucks checkmarked the skate on their jersey while providing a red background. This is horrible. They didn't make it past the 1996-97 season. In 2001-02 with Orca Bay at the controls, the Canucks rolled out a fade-to-red alternate jersey. Again, I find nothing redeeming about this jersey. These lasted until the 2006-07 season. With new ownership yet again, the Canucks went back in time and brought back the stick-in-rink jersey as an alternate. This one is solid, and certainly deserves the thumbs-up. 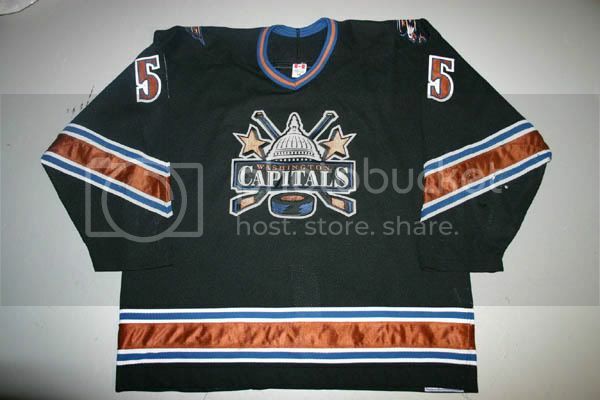 The Washington Capitals went to a black alternate jersey in 1997-98. In a very clear trend, the Capitals replaced their eagle logo road jersey with their black alternate for the start of the 2000-01 season. Now, there are a few teams not listed. The Detroit Red Wings and New Jersey Devils have never used an alternate jersey in their histories. The Chicago Blackhawks and San Jose Sharks are continuing to use a black alternate jersey this season, so they haven't changed anything. The Sharks will update their logo, but the black alternate jersey remains. The Toronto Maple Leafs are still going with a white alternate jersey this season with the throwback logo, so they were not listed as the alternate jersey is still current. The Carolina Hurricanes had not used an alternate jersey previous to this season. Ok, let's check out some other jerseys. 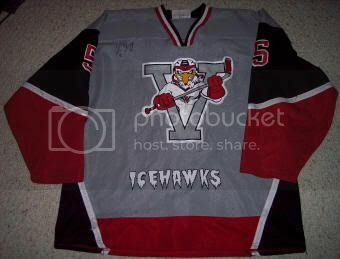 The UHL's Adirondack IceHawks celebrated their 5th anniversary with a jersey. If you've read any of the other You Wearing That? articles, you know how stupid I think this is. 'Nuff said about this. 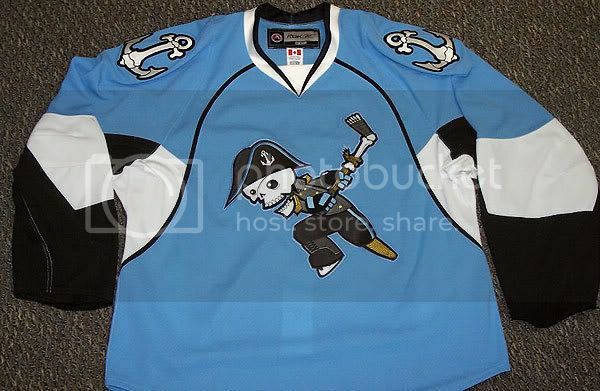 The AHL's Milwaukee Admirals introduced a new alternate jersey earlier this month, and it's a beauty. Love the colour, and the logo is solid. The shoulder logo of the anchor made out of bones is pretty sweet as well. I may have to break the bank and pick one of these up. 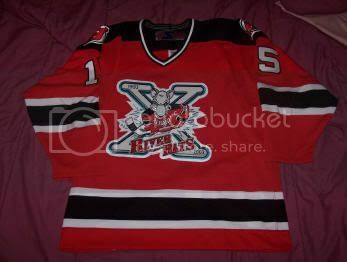 The AHL's Albany River Rats used their jerseys to tell everyone that they turned 10 years old in 2002-03. Again, I can't stress how stupid this idea is. On the charitable side, the River Rats had a jersey for Ronald McDonald House to help raise money. The jersey is kind of gaudy, but the funds raised on March 11, 2007 went to a good cause, so it gets a pass from me. 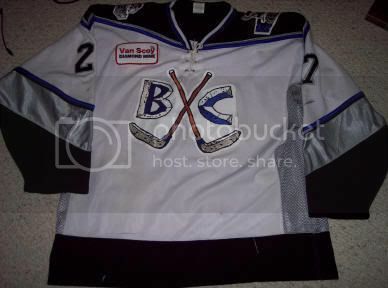 Here are the UHL's BC Icemen's normal jerseys. Nothing special. Their alternate jersey from 2000-01 is even worse, and the logo could have been designed by anyone. 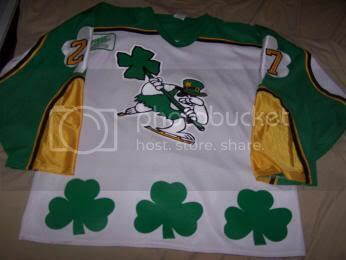 However, they did a great job on the 2000-01 St. Patrick's Day edition of their jersey, and they get full marks for that one. The AHL's Binghamton Senators broke out a couple of great uniforms. First, they played as the Binghamton Dusters on December 15, 2007. 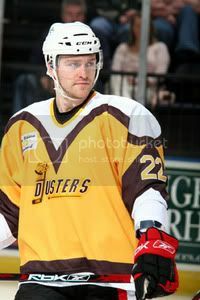 The Dusters existed from 1977 to 1980 in the American Hockey League. Johnny Hart, cartoonist for the comic strip "BC", designed the logo. 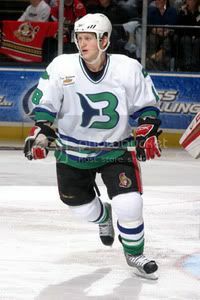 January 12, 2008 saw the Senators don the green-and-white of the Binghamton Whalers. They looked phenomenal, and Jeff Glass brought back memories of Jean-Sebastien Giguere in the Binghamton nets. Both jerseys are amazing! Well done, Binghamton! 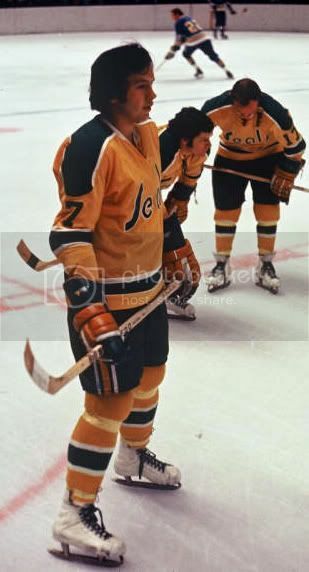 Check out the skates on the California Golden Seals. Maybe Gretzky was paying homage to his former California brethren? Those white skates are a mind-trip for people who only know hockey skates to be black. The USHL's Chicago Steel went pink for breast cancer awareness. I'm all for supporting good causes, but these pink jerseys are getting closer to neon pink. Again, it was for a good cause, so it gets a pass from me. The UHL's Danbury Trashers held a night to honour the men and women in the US military, and it looked pretty decent. The logo is a little tough to see, but the name and number on the back stand out. 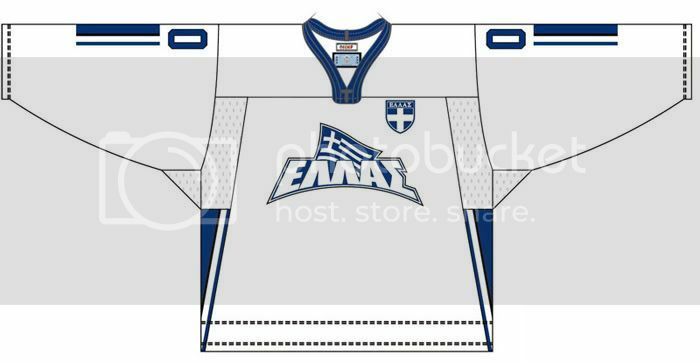 The KHL's Dynamo Riga picked up new jerseys for play in the KHL. They're pretty decent. This press conference shot allows you to see what the jerseys actually look like without all the advertisements on them. Team Greece is preparing for international play, and they got themselves some new threads. The dark jersey seems to have a little more jump to it in terms of bringing out the logo, but the white jersey is still looking great. Simple seems to work much better than crazy in the world of jersey design. The AHL's Iowa Chops have made it abundantly clear that they are the Ducks' AHL affiliate. You know... just take the NHL club's jersey design, and make it your own. Isn't jersey design easy and fun? Excuse my sarcasm. Notice I didn't say anything bad about that giant hog's head on the players' chests? I'll hold my silence on that. 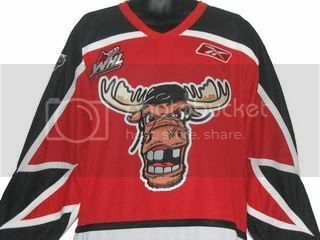 The WHL's Moose Jaw Warriors came out with this alternate jersey. That's atrocious. The logo looks like it's some sort of intellectually-challenged cartoon moose. Is that really how you want your team portrayed? That's brutal. Awful design, Warriors. Anyone remember that experiment that the NHL ran with referees at the All-Star game with silver bands on the arm instead of orange? If you don't, that's ok. 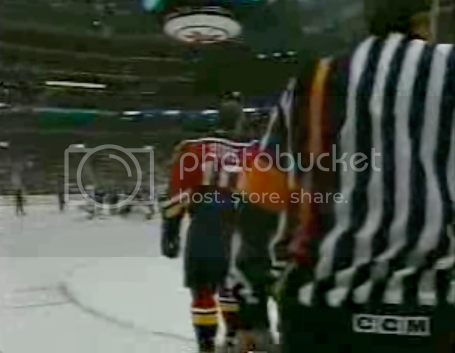 I'll take you back to the 2000 NHL All-Star Game where they had one stripe coloured orange on their uniform. Why? No clue. But just so you don't miss it, here it is in a closer photo. I can't believe some of these ideas make it to production. The AHL's Philadelphia Phantoms held Bobby Clarke Night on March 27, 2008. 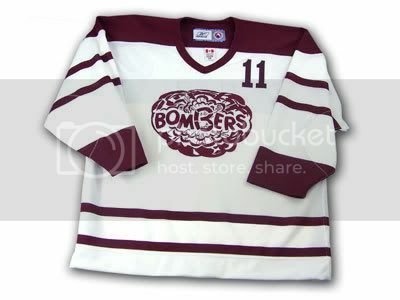 To honour Mr. Clarke, the Phantoms donned the jerseys of the Flin Flon Bombers for the warm-up. 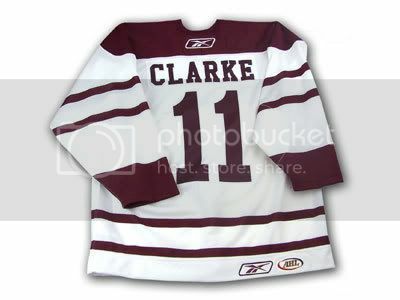 Mr. Clarke played hockey in Flin Flon, Manitoba for the Bombers before being drafted by the Flyers. Everyone skated as Bobby Clarke, leader of the Broadstreet Bullies, for one night. The AHL's Providence Bruins might be the only team that does promotional nights right. They never seem to have a bad look. January 11, 2008 saw them honour the men and women of the US military. 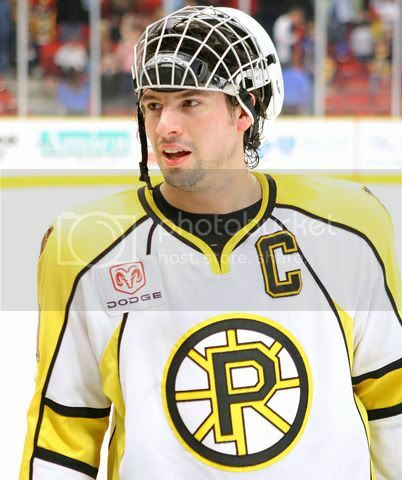 February 8, 2008 had the Bruins on the road dressed as the Providence Reds. The Reds operated in Providence from 1926 until 1977 in several leagues. February 10, 2008 had the Bruins play at home as the Reds. March 15, 2008 saw the Bruins celebrate St. Patrick's Day. And in one of the lesser seen things in hockey, Nat Thompson played part of last season with a cage. Solid jerseys all around for Providence. The AHL's San Antonio Rampage looked south for a promotional night, and came up with Fiesta Night. This could be a decent idea, but the jerseys they came out with for the night were not so decent. I'm not a fan of these. Adding "Fiesta Night" to the sombrero on the bull's head makes it even worse. Ok, so there's a pile of new jerseys to feast your eyes upon. The NHL alternates are a quick look at what some of the alternates used to look like, while the other jerseys are a look at promotional jerseys. Some are good, and some are less than good. - huge thanks goes out to Ben from albanychoppers.com for some of these photos!